The Dow Jones Industrial Average closed at 17,745.98, down -5.41 or -0.03%. S&P 500 closed at 2,108.63 up 0.06 or 0%. Nasdaq Composite closed at 5,128.78 up 17.05 or 0.33%. 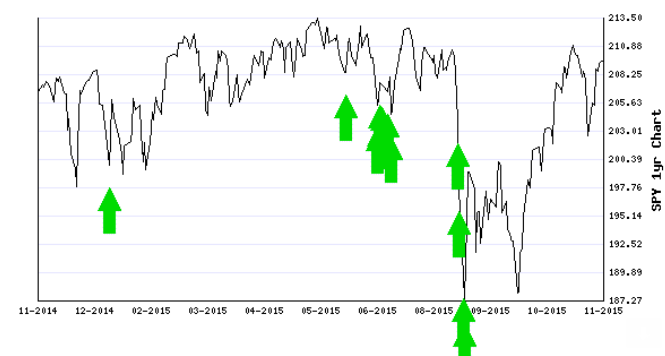 Market conditions are Mildly Bullish in a Bull Market as of 2015-07-30. This means traders and investors should consider trading with a Neutral or Bullish bias by buying (going long) stocks. The rank of the Bull Market is 2.868 which indicates the current market conditions are Extreme, Risk of a reversal is high. 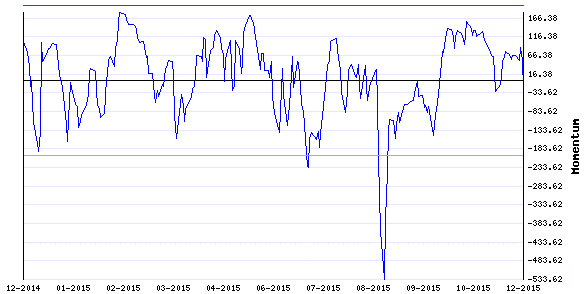 The Momentum Indicator is currently at 31.92 indicating short term Non-trending environment in stocks. This means the stock market is stalling in the current short term trend. Extreme measures of this trend range are -70 to 70. This indicator's trend cycle extremes take place every 3 to 6 months. The Breadth Indicator is currently at 49.29 indicating the breadth of stocks moving higher is neutral. Risk of a trend reversal low. This means the current trend is likely to continue. Extreme measures of this trend range are 30 to 65. This indicator's trend cycle extremes take place every 3 to 6 months. The Sentiment Indicator is currently at 100.00 indicating the sentiment in the stock market is showing extreme complacency. 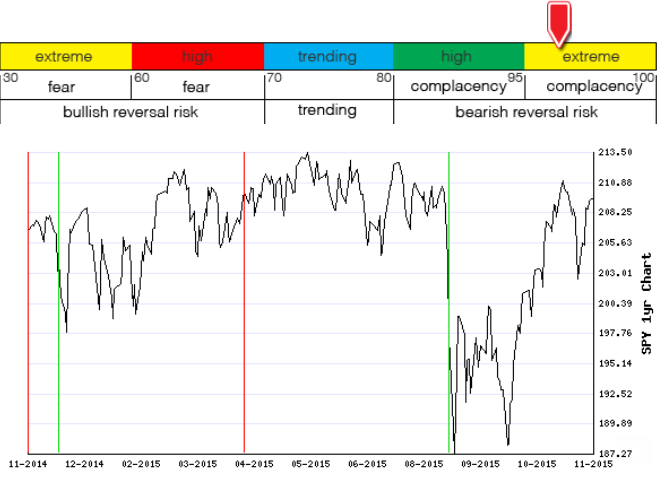 Risk of a long term bearish trend reversal is extreme. This means the current long term bullish trend is NOT likely to continue. Extreme measures of this trend range are 95 to 100. This indicator's trend cycle extremes take place every 18 to 24 months. The Dow Jones Industrial Average closed at 17,419.75, down -120.72 or -0.69%. S&P 500 closed at 2,083.56 down -16.28 or -0.78%. Nasdaq Composite closed at 5,056.44 down -83.50 or -1.62%. 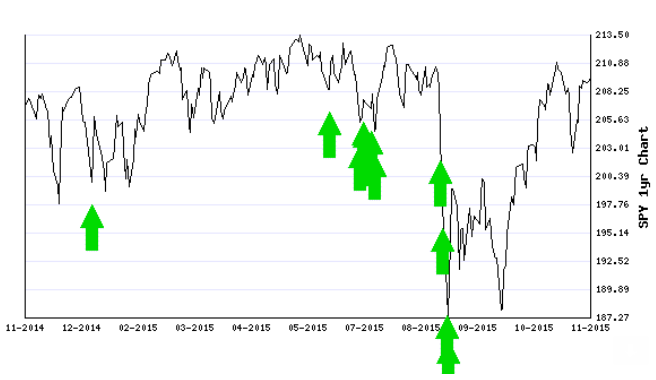 Market conditions are Mildly Bearish in a Bull Market as of 2015-08-06. This means traders and investors should consider trading with a Neutral or Bearish bias by raising stop levels on winners and selling losers. The rank of the Bull Market is 2.767 which indicates the current market conditions are Extreme, Risk of a reversal is high. 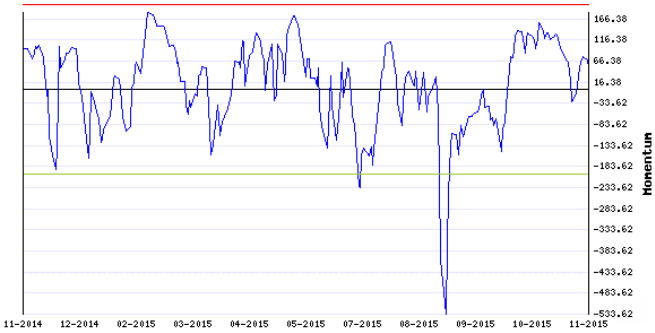 The Momentum Indicator is currently at -12.38 indicating short term Non-trending environment in stocks. This means the stock market is stalling in the current short term trend. Extreme measures of this trend range are -70 to 70. This indicator's trend cycle extremes take place every 3 to 6 months. The Breadth Indicator is currently at 46.68 indicating the breadth of stocks moving higher is neutral. Risk of a trend reversal low. This means the current trend is likely to continue. Extreme measures of this trend range are 30 to 65. This indicator's trend cycle extremes take place every 3 to 6 months. The Sentiment Indicator is currently at 98.91 indicating the sentiment in the stock market is showing extreme complacency. Risk of a long term bearish trend reversal is extreme. This means the current long term bullish trend is NOT likely to continue. Extreme measures of this trend range are 95 to 100. This indicator's trend cycle extremes take place every 18 to 24 months. The Dow Jones Industrial Average closed at 17,402.84, down -212.33 or -1.21%. S&P 500 closed at 2,084.07 down -20.10 or -0.96%. Nasdaq Composite closed at 5,036.79 down -65.01 or -1.27%. 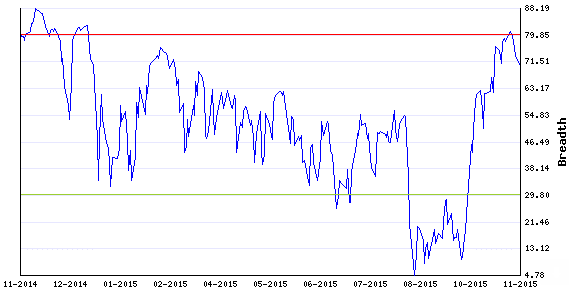 Market conditions are Mildly Bearish in a Bull Market as of 2015-08-11. This means traders and investors should consider trading with a Neutral or Bearish bias by raising stop levels on winners and selling losers. The rank of the Bull Market is 2.705 which indicates the current market conditions are Extreme, Risk of a reversal is high. 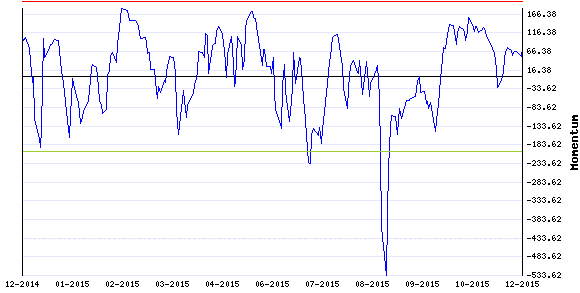 The Momentum Indicator is currently at -18.58 indicating short term Non-trending environment in stocks. This means the stock market is stalling in the current short term trend. Extreme measures of this trend range are -70 to 70. This indicator's trend cycle extremes take place every 3 to 6 months. The Breadth Indicator is currently at 50.00 indicating the breadth of stocks moving higher is neutral. Risk of a trend reversal low. This means the current trend is likely to continue. Extreme measures of this trend range are 30 to 65. This indicator's trend cycle extremes take place every 3 to 6 months. The Sentiment Indicator is currently at 98.99 indicating the sentiment in the stock market is showing extreme complacency. 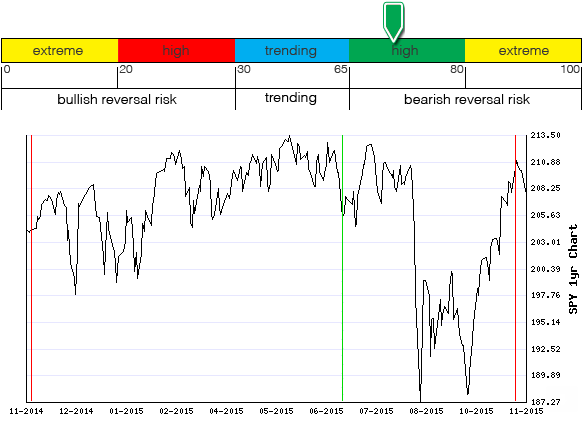 Risk of a long term bearish trend reversal is extreme. This means the current long term bullish trend is NOT likely to continue. Extreme measures of this trend range are 95 to 100. This indicator's trend cycle extremes take place every 18 to 24 months. The Dow Jones Industrial Average closed at 17,402.51, down -0.33 or -0%. S&P 500 closed at 2,086.05 up 1.98 or 0.1%. Nasdaq Composite closed at 5,044.39 up 7.60 or 0.15%. 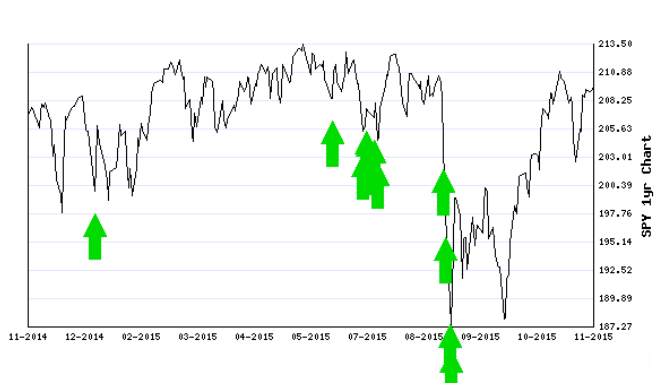 Market conditions are Mildly Bearish in a Bull Market as of 2015-08-12. This means traders and investors should consider trading with a Neutral or Bearish bias by raising stop levels on winners and selling losers. The rank of the Bull Market is 2.677 which indicates the current market conditions are Extreme, Risk of a reversal is high. The Momentum Indicator is currently at -53.55 indicating short term Non-trending environment in stocks. This means the stock market is stalling in the current short term trend. Extreme measures of this trend range are -70 to 70. This indicator's trend cycle extremes take place every 3 to 6 months. The Breadth Indicator is currently at 46.61 indicating the breadth of stocks moving higher is neutral. Risk of a trend reversal low. This means the current trend is likely to continue. Extreme measures of this trend range are 30 to 65. This indicator's trend cycle extremes take place every 3 to 6 months. The Sentiment Indicator is currently at 99.14 indicating the sentiment in the stock market is showing extreme complacency. 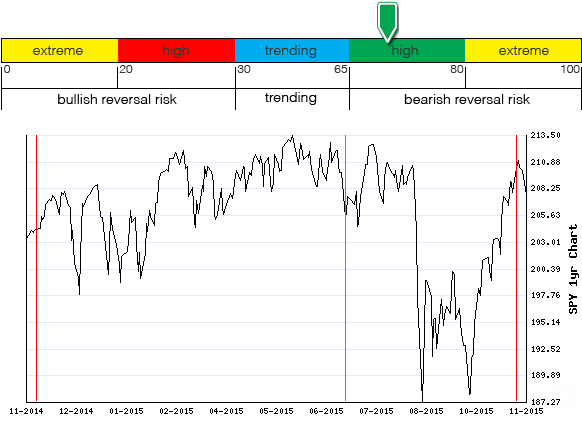 Risk of a long term bearish trend reversal is extreme. This means the current long term bullish trend is NOT likely to continue. Extreme measures of this trend range are 95 to 100. This indicator's trend cycle extremes take place every 18 to 24 months. The Dow Jones Industrial Average closed at 17,545.18, up 67.78 or 0.39%. S&P 500 closed at 2,102.44 up 10.90 or 0.52%. Nasdaq Composite closed at 5,091.70 up 43.46 or 0.86%. Market conditions are Mildly Bullish in a Bull Market as of 2015-08-17. This means traders and investors should consider trading with a Neutral or Bullish bias by buying (going long) stocks. The rank of the Bull Market is 2.622 which indicates the current market conditions are Extreme, Risk of a reversal is high. 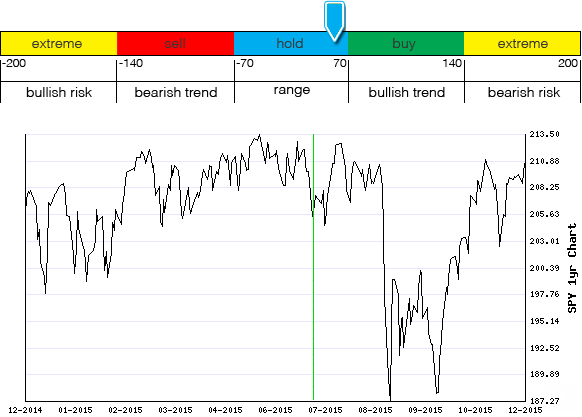 The Momentum Indicator is currently at 16.83 indicating short term Non-trending environment in stocks. This means the stock market is stalling in the current short term trend. Extreme measures of this trend range are -70 to 70. This indicator's trend cycle extremes take place every 3 to 6 months. The Breadth Indicator is currently at 54.78 indicating the breadth of stocks moving higher is neutral. Risk of a trend reversal low. This means the current trend is likely to continue. Extreme measures of this trend range are 30 to 65. This indicator's trend cycle extremes take place every 3 to 6 months. The Sentiment Indicator is currently at 99.97 indicating the sentiment in the stock market is showing extreme complacency. 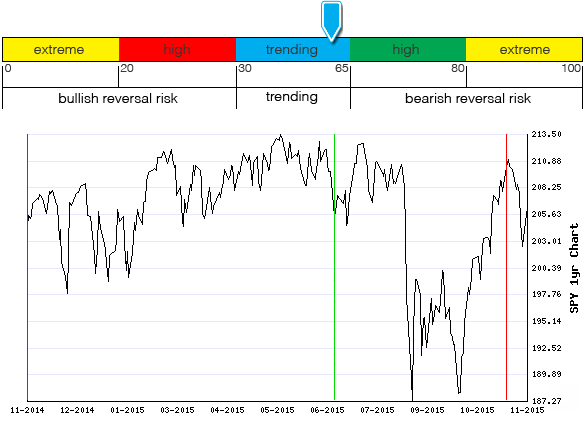 Risk of a long term bearish trend reversal is extreme. This means the current long term bullish trend is NOT likely to continue. Extreme measures of this trend range are 95 to 100. This indicator's trend cycle extremes take place every 18 to 24 months. The Dow Jones Industrial Average closed at 17,511.34, down -33.84 or -0.19%. S&P 500 closed at 2,096.92 down -5.52 or -0.26%. Nasdaq Composite closed at 5,059.35 down -32.35 or -0.64%. 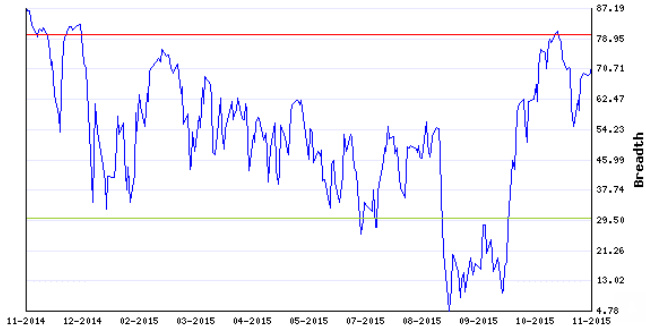 Market conditions are Mildly Bullish in a Bull Market as of 2015-08-18. This means traders and investors should consider trading with a Neutral or Bullish bias by buying (going long) stocks. The rank of the Bull Market is 2.604 which indicates the current market conditions are Extreme, Risk of a reversal is high. 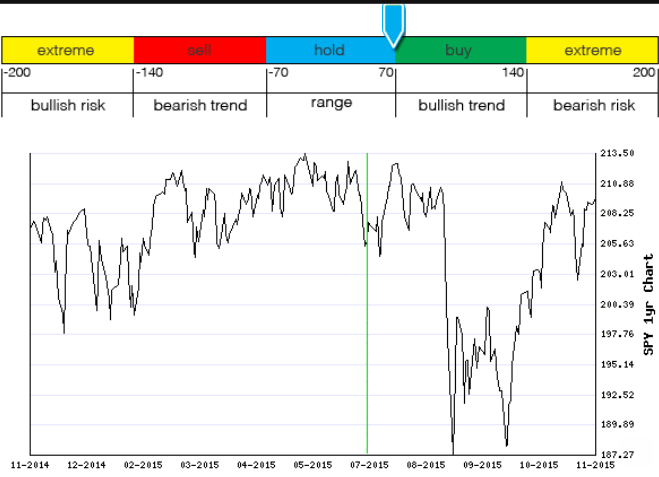 The Momentum Indicator is currently at 28.85 indicating short term Non-trending environment in stocks. This means the stock market is stalling in the current short term trend. Extreme measures of this trend range are -70 to 70. This indicator's trend cycle extremes take place every 3 to 6 months. The Breadth Indicator is currently at 54.38 indicating the breadth of stocks moving higher is neutral. Risk of a trend reversal low. This means the current trend is likely to continue. Extreme measures of this trend range are 30 to 65. This indicator's trend cycle extremes take place every 3 to 6 months. The Sentiment Indicator is currently at 98.88 indicating the sentiment in the stock market is showing extreme complacency. 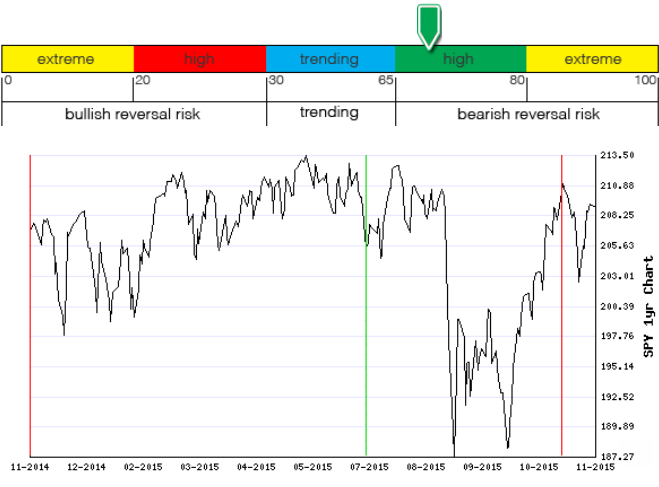 Risk of a long term bearish trend reversal is extreme. This means the current long term bullish trend is NOT likely to continue. Extreme measures of this trend range are 95 to 100. This indicator's trend cycle extremes take place every 18 to 24 months. The Dow Jones Industrial Average closed at 16,285.51, up 619.07 or 3.95%. S&P 500 closed at 1,940.51 up 72.90 or 3.9%. Nasdaq Composite closed at 4,697.54 up 191.05 or 4.24%. Market conditions are Bearish in a Bull Market as of 2015-08-26. This means traders and investors should consider trading with a Bearish bias by raising stop levels on winners and selling losers. Aggressive traders should consider buying put options or shorting stocks with 10% or less of their portfolio. The rank of the Bull Market is 1.787 which indicates the current market conditions are Extreme, Risk of a reversal is high. The Momentum Indicator is currently at -245.82 indicating a bearish trend in stocks, but with extreme short term bullish risk. This means the risk of the current bearish short term trend reversing or stalling is very high. Extreme measures of this trend range are -140 to -200. This indicator's trend cycle extremes take place every 3 to 6 months. The Breadth Indicator is currently at 11.15 indicating the breadth of stocks is very bearish. Risk of a bullish trend reversal is extreme. This means the current bearish trend is NOT likely to continue. Extreme measures of this trend range are 0 to 20. This indicator's trend cycle extremes take place every 3 to 6 months. The Sentiment Indicator is currently at 75.44 indicating the sentiment in the stock market is neutral. Risk of a long term trend reversal low. This means the current long term trend is likely to continue. Extreme measures of this trend range are 70 to 80. This indicator's trend cycle extremes take place every 18 to 24 months. The Dow Jones Industrial Average closed at 16,654.77, up 369.26 or 2.27%. S&P 500 closed at 1,987.66 up 47.15 or 2.43%. Nasdaq Composite closed at 4,812.71 up 115.17 or 2.45%. 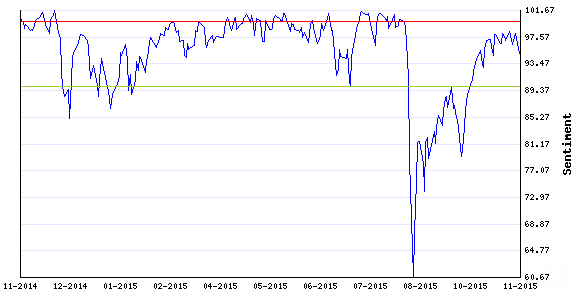 Market conditions are Bearish in a Bull Market as of 2015-08-27. This means traders and investors should consider trading with a Bearish bias by raising stop levels on winners and selling losers. Aggressive traders should consider buying put options or shorting stocks with 10% or less of their portfolio. The rank of the Bull Market is 1.688 which indicates the current market conditions are Extreme, Risk of a reversal is high. The Momentum Indicator is currently at -135.78 indicating a bearish trend in stocks. Risk of a short term trend reversal is low. This means the current bearish short term trend is likely to continue. Extreme measures of this trend range are -70 to -140. This indicator's trend cycle extremes take place every 3 to 6 months. The Breadth Indicator is currently at 20.11 indicating the breadth of stocks is bearish. Risk of a bullish trend reversal is high. This means the current bearish trend is likely to continue. Extreme measures of this trend range are 20 to 30. This indicator's trend cycle extremes take place every 3 to 6 months. The Sentiment Indicator is currently at 81.43 indicating the sentiment in the stock market is showing high complacency. Risk of a long term trend reversal is low. This means the current long term trend is likely to continue. Extreme measures of this trend range are to 80 to 90. This indicator's trend cycle extremes take place every 18 to 24 months. The Dow Jones Industrial Average closed at 16,528.03, down -114.98 or -0.69%. S&P 500 closed at 1,972.18 down -16.69 or -0.84%. Nasdaq Composite closed at 4,776.51 down -51.81 or -1.07%. 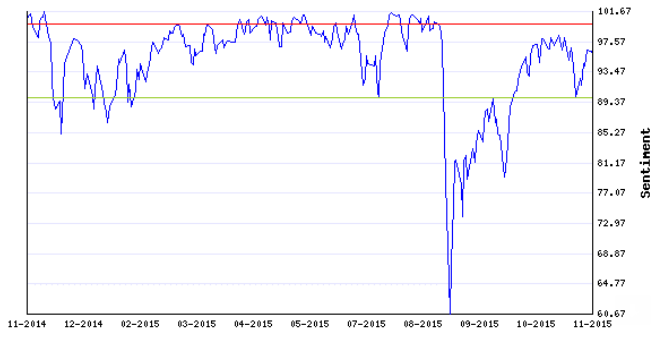 Market conditions are Bearish in a Bull Market as of 2015-08-31. This means traders and investors should consider trading with a Bearish bias by raising stop levels on winners and selling losers. Aggressive traders should consider buying put options or shorting stocks with 10% or less of their portfolio. The rank of the Bull Market is 1.479 which indicates the current market conditions are Extreme, Risk of a reversal is high. The Momentum Indicator is currently at -107.07 indicating a bearish trend in stocks. Risk of a short term trend reversal is low. This means the current bearish short term trend is likely to continue. Extreme measures of this trend range are -70 to -140. 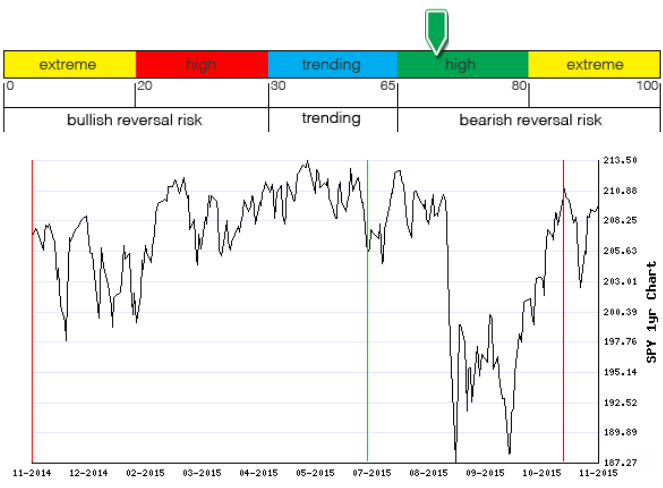 This indicator's trend cycle extremes take place every 3 to 6 months. The Breadth Indicator is currently at 15.73 indicating the breadth of stocks is very bearish. Risk of a bullish trend reversal is extreme. This means the current bearish trend is NOT likely to continue. Extreme measures of this trend range are 0 to 20. This indicator's trend cycle extremes take place every 3 to 6 months. The Sentiment Indicator is currently at 78.12 indicating the sentiment in the stock market is neutral. Risk of a long term trend reversal low. This means the current long term trend is likely to continue. Extreme measures of this trend range are 70 to 80. This indicator's trend cycle extremes take place every 18 to 24 months. The Dow Jones Industrial Average closed at 16,058.35, down -469.68 or -2.84%. S&P 500 closed at 1,913.85 down -58.33 or -2.96%. Nasdaq Composite closed at 4,636.10 down -140.41 or -2.94%. Market conditions are Bearish in a Bull Market as of 2015-09-01. This means traders and investors should consider trading with a Bearish bias by raising stop levels on winners and selling losers. Aggressive traders should consider buying put options or shorting stocks with 10% or less of their portfolio. The rank of the Bull Market is 1.313 which indicates the current market conditions are Extreme, Risk of a reversal is high. 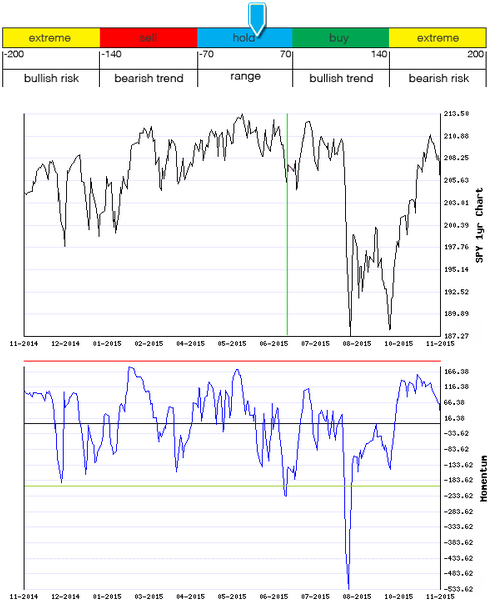 The Momentum Indicator is currently at -154.77 indicating a bearish trend in stocks, but with extreme short term bullish risk. This means the risk of the current bearish short term trend reversing or stalling is very high. Extreme measures of this trend range are -140 to -200. This indicator's trend cycle extremes take place every 3 to 6 months. The Breadth Indicator is currently at 8.58 indicating the breadth of stocks is very bearish. Risk of a bullish trend reversal is extreme. This means the current bearish trend is NOT likely to continue. Extreme measures of this trend range are 0 to 20. This indicator's trend cycle extremes take place every 3 to 6 months. The Sentiment Indicator is currently at 73.91 indicating the sentiment in the stock market is neutral. Risk of a long term trend reversal low. This means the current long term trend is likely to continue. Extreme measures of this trend range are 70 to 80. This indicator's trend cycle extremes take place every 18 to 24 months. The Dow Jones Industrial Average closed at 16,351.38, up 293.03 or 1.82%. S&P 500 closed at 1,948.86 up 35.01 or 1.83%. Nasdaq Composite closed at 4,749.98 up 113.88 or 2.46%. Market conditions are Bearish in a Bull Market as of 2015-09-02. This means traders and investors should consider trading with a Bearish bias by raising stop levels on winners and selling losers. Aggressive traders should consider buying put options or shorting stocks with 10% or less of their portfolio. The rank of the Bull Market is 1.187 which indicates the current market conditions are Extreme, Risk of a reversal is high. The Momentum Indicator is currently at -115.90 indicating a bearish trend in stocks. Risk of a short term trend reversal is low. This means the current bearish short term trend is likely to continue. Extreme measures of this trend range are -70 to -140. This indicator's trend cycle extremes take place every 3 to 6 months. The Breadth Indicator is currently at 13.37 indicating the breadth of stocks is very bearish. Risk of a bullish trend reversal is extreme. This means the current bearish trend is NOT likely to continue. Extreme measures of this trend range are 0 to 20. This indicator's trend cycle extremes take place every 3 to 6 months. The Sentiment Indicator is currently at 81.44 indicating the sentiment in the stock market is showing high complacency. Risk of a long term trend reversal is low. This means the current long term trend is likely to continue. Extreme measures of this trend range are to 80 to 90. This indicator's trend cycle extremes take place every 18 to 24 months. The Dow Jones Industrial Average closed at 16,374.76, up 23.38 or 0.14%. S&P 500 closed at 1,951.13 up 2.27 or 0.12%. Nasdaq Composite closed at 4,733.50 down -16.48 or -0.35%. 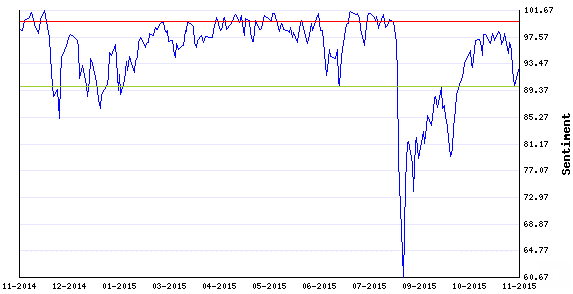 Market conditions are Bearish in a Bull Market as of 2015-09-03. This means traders and investors should consider trading with a Bearish bias by raising stop levels on winners and selling losers. Aggressive traders should consider buying put options or shorting stocks with 10% or less of their portfolio. The rank of the Bull Market is 1.064 which indicates the current market conditions are Extreme, Risk of a reversal is high. The Momentum Indicator is currently at -87.19 indicating a bearish trend in stocks. Risk of a short term trend reversal is low. This means the current bearish short term trend is likely to continue. Extreme measures of this trend range are -70 to -140. 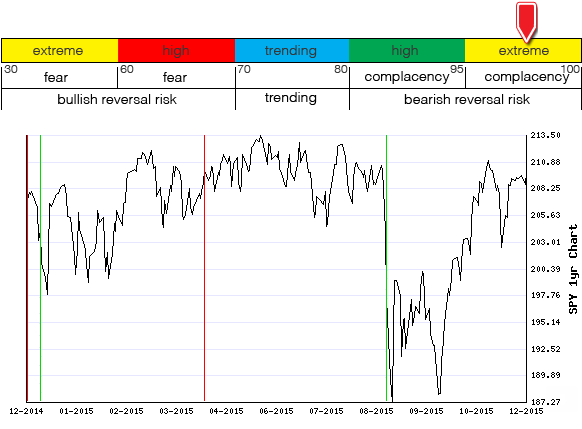 This indicator's trend cycle extremes take place every 3 to 6 months. The Breadth Indicator is currently at 15.16 indicating the breadth of stocks is very bearish. Risk of a bullish trend reversal is extreme. This means the current bearish trend is NOT likely to continue. Extreme measures of this trend range are 0 to 20. This indicator's trend cycle extremes take place every 3 to 6 months. The Sentiment Indicator is currently at 82.12 indicating the sentiment in the stock market is showing high complacency. Risk of a long term trend reversal is low. This means the current long term trend is likely to continue. Extreme measures of this trend range are to 80 to 90. This indicator's trend cycle extremes take place every 18 to 24 months. The Dow Jones Industrial Average closed at 16,102.38, down -272.38 or -1.66%. S&P 500 closed at 1,921.22 down -29.91 or -1.53%. Nasdaq Composite closed at 4,683.92 down -49.58 or -1.05%. Market conditions are Bearish in a Bull Market as of 2015-09-04. This means traders and investors should consider trading with a Bearish bias by raising stop levels on winners and selling losers. Aggressive traders should consider buying put options or shorting stocks with 10% or less of their portfolio. The rank of the Bull Market is 0.91199999999998 which indicates the current market conditions are Extreme, Risk of a reversal is high. The Momentum Indicator is currently at -112.14 indicating a bearish trend in stocks. Risk of a short term trend reversal is low. This means the current bearish short term trend is likely to continue. Extreme measures of this trend range are -70 to -140. This indicator's trend cycle extremes take place every 3 to 6 months. 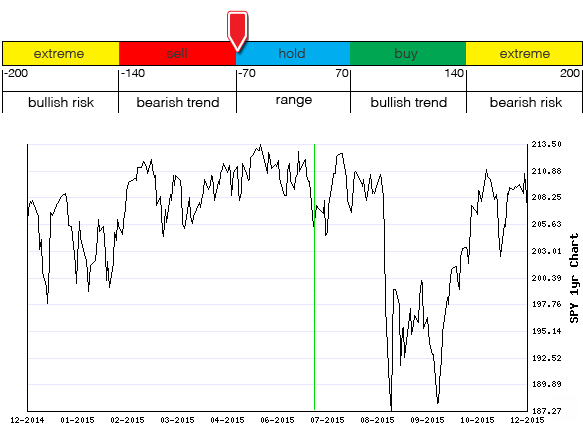 The Breadth Indicator is currently at 10.00 indicating the breadth of stocks is very bearish. Risk of a bullish trend reversal is extreme. This means the current bearish trend is NOT likely to continue. Extreme measures of this trend range are 0 to 20. This indicator's trend cycle extremes take place every 3 to 6 months. The Sentiment Indicator is currently at 79.01 indicating the sentiment in the stock market is neutral. Risk of a long term trend reversal low. This means the current long term trend is likely to continue. Extreme measures of this trend range are 70 to 80. This indicator's trend cycle extremes take place every 18 to 24 months. The Dow Jones Industrial Average closed at 16,492.68, up 390.30 or 2.42%. S&P 500 closed at 1,969.41 up 48.19 or 2.51%. Nasdaq Composite closed at 4,811.93 up 128.01 or 2.73%. Market conditions are Mildly Bullish in a Bull Market as of 2015-09-08. This means traders and investors should consider trading with a Neutral or Bullish bias by buying (going long) stocks. The rank of the Bull Market is 0.792 which indicates the current market conditions are Extreme, Risk of a reversal is high. 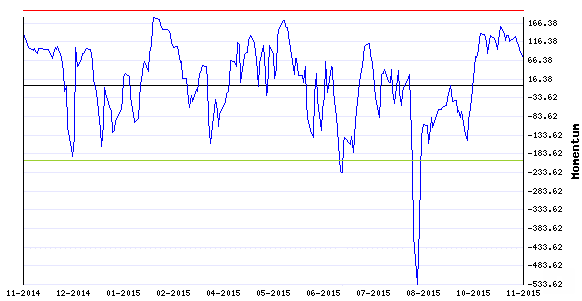 The Momentum Indicator is currently at -65.78 indicating short term Non-trending environment in stocks. This means the stock market is stalling in the current short term trend. Extreme measures of this trend range are -70 to 70. This indicator's trend cycle extremes take place every 3 to 6 months. The Breadth Indicator is currently at 19.20 indicating the breadth of stocks is very bearish. Risk of a bullish trend reversal is extreme. This means the current bearish trend is NOT likely to continue. Extreme measures of this trend range are 0 to 20. This indicator's trend cycle extremes take place every 3 to 6 months. The Sentiment Indicator is currently at 83.13 indicating the sentiment in the stock market is showing high complacency. Risk of a long term trend reversal is low. This means the current long term trend is likely to continue. Extreme measures of this trend range are to 80 to 90. This indicator's trend cycle extremes take place every 18 to 24 months. The Dow Jones Industrial Average closed at 16,253.57, down -239.11 or -1.45%. S&P 500 closed at 1,942.04 down -27.37 or -1.39%. Nasdaq Composite closed at 4,756.53 down -55.40 or -1.15%. 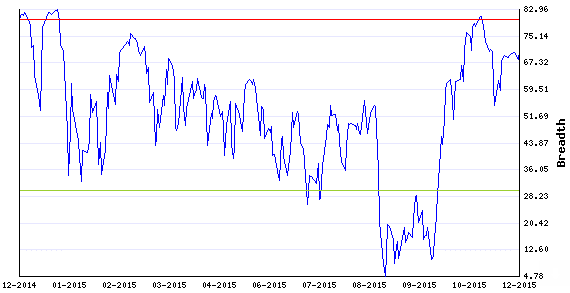 Market conditions are Mildly Bearish in a Bull Market as of 2015-09-09. This means traders and investors should consider trading with a Neutral or Bearish bias by raising stop levels on winners and selling losers. The rank of the Bull Market is 0.67299999999997 which indicates the current market conditions are Extreme, Risk of a reversal is high. The Momentum Indicator is currently at -65.75 indicating short term Non-trending environment in stocks. This means the stock market is stalling in the current short term trend. Extreme measures of this trend range are -70 to 70. This indicator's trend cycle extremes take place every 3 to 6 months. The Breadth Indicator is currently at 14.80 indicating the breadth of stocks is very bearish. Risk of a bullish trend reversal is extreme. This means the current bearish trend is NOT likely to continue. Extreme measures of this trend range are 0 to 20. This indicator's trend cycle extremes take place every 3 to 6 months. The Sentiment Indicator is currently at 81.24 indicating the sentiment in the stock market is showing high complacency. Risk of a long term trend reversal is low. This means the current long term trend is likely to continue. Extreme measures of this trend range are to 80 to 90. This indicator's trend cycle extremes take place every 18 to 24 months. The Dow Jones Industrial Average closed at 16,330.40, up 76.83 or 0.47%. S&P 500 closed at 1,952.29 up 10.25 or 0.53%. Nasdaq Composite closed at 4,796.25 up 39.72 or 0.84%. 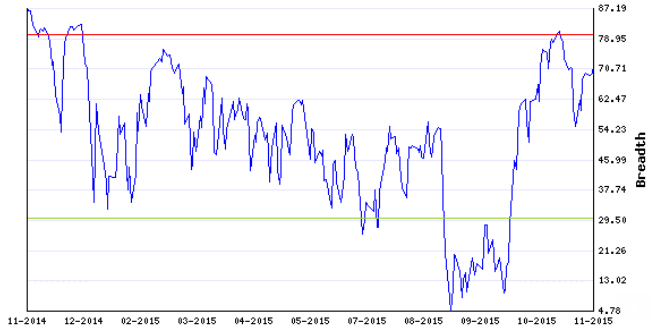 Market conditions are Mildly Bearish in a Bull Market as of 2015-09-10. This means traders and investors should consider trading with a Neutral or Bearish bias by raising stop levels on winners and selling losers. 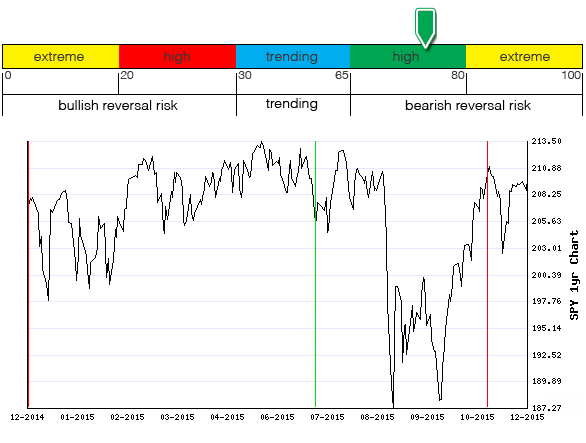 The rank of the Bull Market is 0.565 which indicates the current market conditions are Extreme, Risk of a reversal is high. 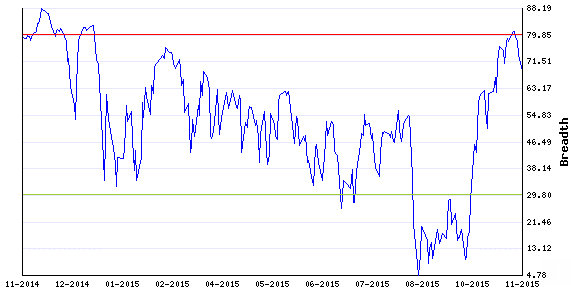 The Momentum Indicator is currently at -64.92 indicating short term Non-trending environment in stocks. This means the stock market is stalling in the current short term trend. Extreme measures of this trend range are -70 to 70. This indicator's trend cycle extremes take place every 3 to 6 months. The Breadth Indicator is currently at 15.80 indicating the breadth of stocks is very bearish. Risk of a bullish trend reversal is extreme. This means the current bearish trend is NOT likely to continue. Extreme measures of this trend range are 0 to 20. This indicator's trend cycle extremes take place every 3 to 6 months. The Sentiment Indicator is currently at 83.88 indicating the sentiment in the stock market is showing high complacency. Risk of a long term trend reversal is low. This means the current long term trend is likely to continue. Extreme measures of this trend range are to 80 to 90. This indicator's trend cycle extremes take place every 18 to 24 months. The Dow Jones Industrial Average closed at 16,370.96, down -62.13 or -0.38%. S&P 500 closed at 1,953.03 down -8.02 or -0.41%. Nasdaq Composite closed at 4,805.76 down -16.58 or -0.34%. Market conditions are Mildly Bearish in a Bull Market as of 2015-09-14. This means traders and investors should consider trading with a Neutral or Bearish bias by raising stop levels on winners and selling losers. The rank of the Bull Market is 0.35899999999998 which indicates the current market conditions are Extreme, Risk of a reversal is high. 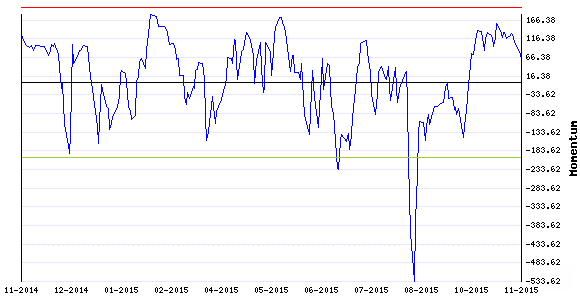 The Momentum Indicator is currently at -53.36 indicating short term Non-trending environment in stocks. This means the stock market is stalling in the current short term trend. Extreme measures of this trend range are -70 to 70. This indicator's trend cycle extremes take place every 3 to 6 months. The Breadth Indicator is currently at 16.20 indicating the breadth of stocks is very bearish. Risk of a bullish trend reversal is extreme. This means the current bearish trend is NOT likely to continue. Extreme measures of this trend range are 0 to 20. This indicator's trend cycle extremes take place every 3 to 6 months. The Sentiment Indicator is currently at 84.05 indicating the sentiment in the stock market is showing high complacency. Risk of a long term trend reversal is low. This means the current long term trend is likely to continue. Extreme measures of this trend range are to 80 to 90. This indicator's trend cycle extremes take place every 18 to 24 months. The Dow Jones Industrial Average closed at 16,599.85, up 228.89 or 1.4%. S&P 500 closed at 1,978.09 up 25.06 or 1.28%. Nasdaq Composite closed at 4,860.52 up 54.76 or 1.14%. Market conditions are Mildly Bullish in a Bull Market as of 2015-09-15. This means traders and investors should consider trading with a Neutral or Bullish bias by buying (going long) stocks. The rank of the Bull Market is 0.28800000000001 which indicates the current market conditions are Extreme, Risk of a reversal is high. 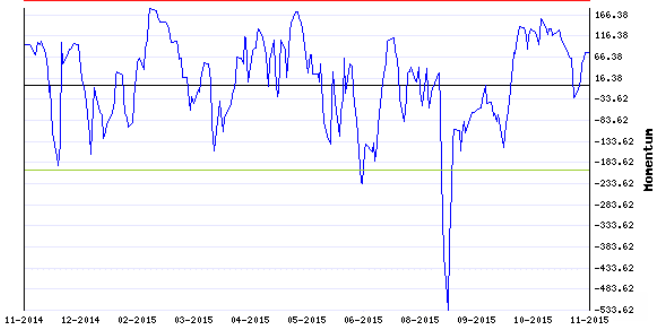 The Momentum Indicator is currently at -34.26 indicating short term Non-trending environment in stocks. This means the stock market is stalling in the current short term trend. Extreme measures of this trend range are -70 to 70. This indicator's trend cycle extremes take place every 3 to 6 months. The Breadth Indicator is currently at 21.79 indicating the breadth of stocks is bearish. Risk of a bullish trend reversal is high. This means the current bearish trend is likely to continue. Extreme measures of this trend range are 20 to 30. This indicator's trend cycle extremes take place every 3 to 6 months. 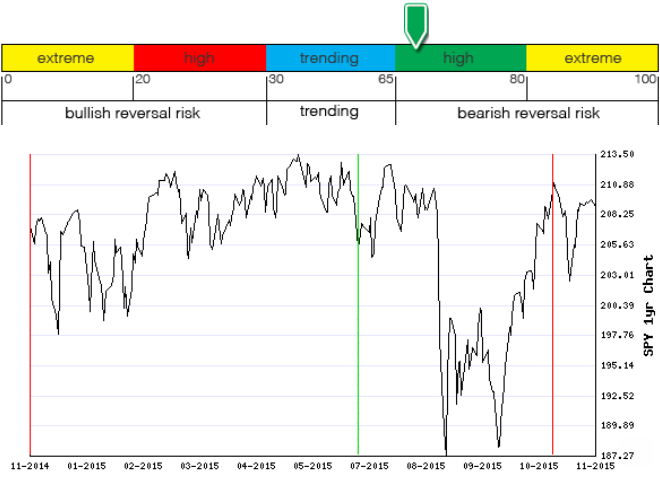 The Sentiment Indicator is currently at 86.47 indicating the sentiment in the stock market is showing high complacency. Risk of a long term trend reversal is low. This means the current long term trend is likely to continue. Extreme measures of this trend range are to 80 to 90. This indicator's trend cycle extremes take place every 18 to 24 months. The Dow Jones Industrial Average closed at 16,739.95, up 140.10 or 0.84%. S&P 500 closed at 1,995.31 up 17.22 or 0.87%. Nasdaq Composite closed at 4,889.24 up 28.72 or 0.59%. 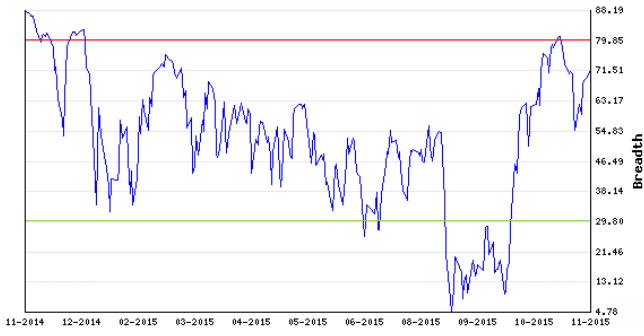 Market conditions are Mildly Bullish in a Bull Market as of 2015-09-16. This means traders and investors should consider trading with a Neutral or Bullish bias by buying (going long) stocks. The rank of the Bull Market is 0.23699999999999 which indicates the current market conditions are Extreme, Risk of a reversal is high. 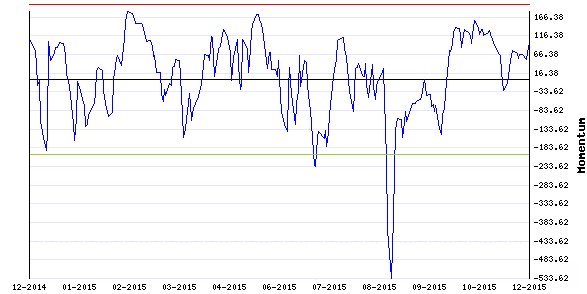 The Momentum Indicator is currently at -12.71 indicating short term Non-trending environment in stocks. This means the stock market is stalling in the current short term trend. Extreme measures of this trend range are -70 to 70. This indicator's trend cycle extremes take place every 3 to 6 months. The Breadth Indicator is currently at 28.20 indicating the breadth of stocks is bearish. Risk of a bullish trend reversal is high. This means the current bearish trend is likely to continue. Extreme measures of this trend range are 20 to 30. This indicator's trend cycle extremes take place every 3 to 6 months. 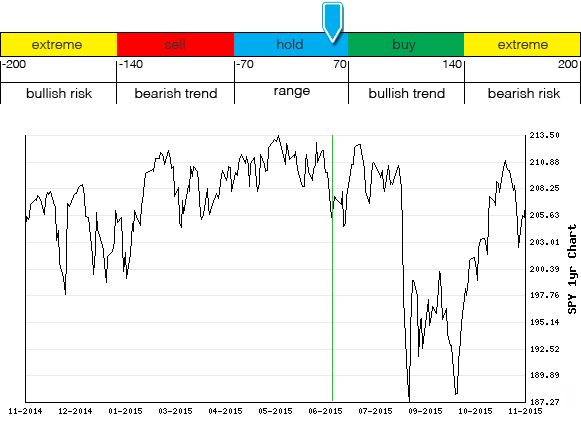 The Sentiment Indicator is currently at 88.16 indicating the sentiment in the stock market is showing high complacency. Risk of a long term trend reversal is low. This means the current long term trend is likely to continue. Extreme measures of this trend range are to 80 to 90. This indicator's trend cycle extremes take place every 18 to 24 months. The Dow Jones Industrial Average closed at 16,674.74, down -65.21 or -0.39%. S&P 500 closed at 1,990.20 down -5.11 or -0.26%. Nasdaq Composite closed at 4,893.95 up 4.71 or 0.1%. Market conditions are Mildly Bullish in a Bull Market as of 2015-09-17. This means traders and investors should consider trading with a Neutral or Bullish bias by buying (going long) stocks. The rank of the Bull Market is 0.17899999999997 which indicates the current market conditions are Extreme, Risk of a reversal is high. 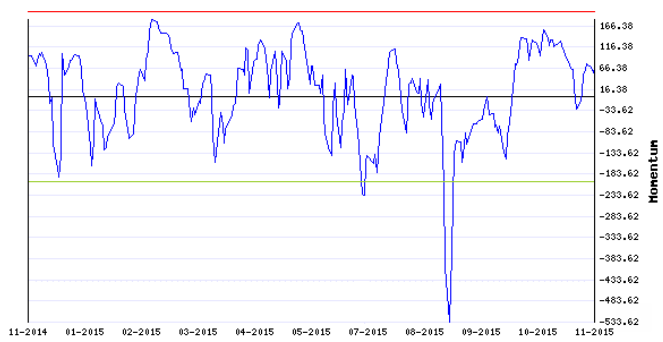 The Momentum Indicator is currently at 0.99 indicating short term Non-trending environment in stocks. This means the stock market is stalling in the current short term trend. Extreme measures of this trend range are -70 to 70. This indicator's trend cycle extremes take place every 3 to 6 months. The Breadth Indicator is currently at 28.39 indicating the breadth of stocks is bearish. Risk of a bullish trend reversal is high. This means the current bearish trend is likely to continue. Extreme measures of this trend range are 20 to 30. This indicator's trend cycle extremes take place every 3 to 6 months. 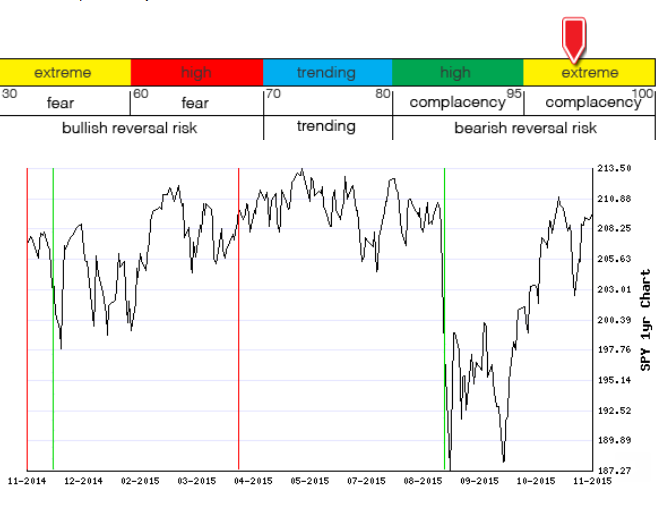 The Sentiment Indicator is currently at 88.46 indicating the sentiment in the stock market is showing high complacency. Risk of a long term trend reversal is low. This means the current long term trend is likely to continue. Extreme measures of this trend range are to 80 to 90. This indicator's trend cycle extremes take place every 18 to 24 months. The Dow Jones Industrial Average closed at 16,001.89, down -312.78 or -1.92%. S&P 500 closed at 1,881.77 down -49.57 or -2.57%. Nasdaq Composite closed at 4,543.97 down -142.53 or -3.04%. 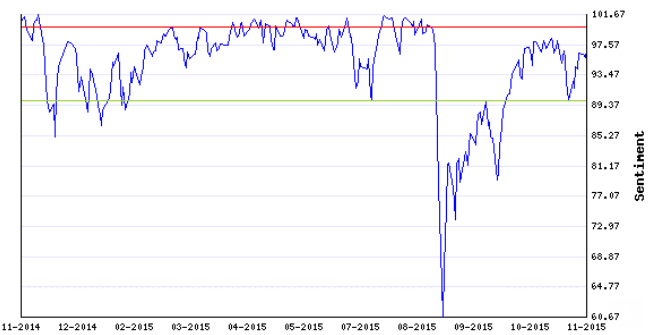 Market conditions are Bearish in a Bear Market as of 2015-09-28. This means traders and investors should consider trading with a Bearish bias by shorting stocks, buying inverse-ETF's or buying put options. The rank of the Bear Market is -0.57. The Most recent Sell Signal came on Sept 21, 2015. The Momentum Indicator is currently at -131.70 indicating a bearish trend in stocks. Risk of a short term trend reversal is low. This means the current bearish short term trend is likely to continue. Extreme measures of this trend range are -70 to -140. 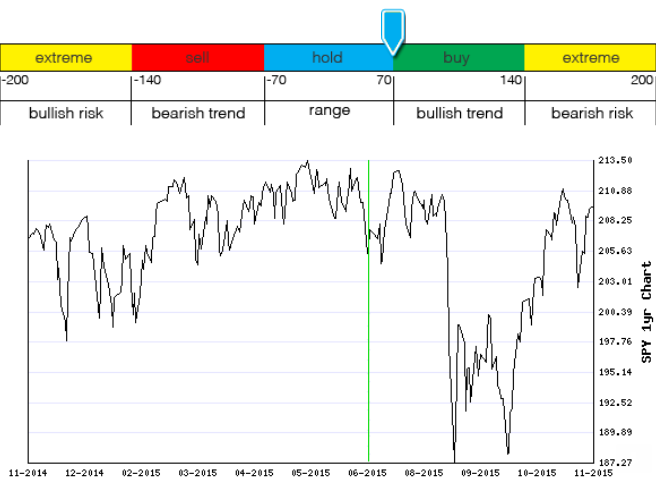 This indicator's trend cycle extremes take place every 3 to 6 months. The Breadth Indicator is currently at 9.80 indicating the breadth of stocks is very bearish. Risk of a bullish trend reversal is extreme. This means the current bearish trend is NOT likely to continue. Extreme measures of this trend range are 0 to 20. This indicator's trend cycle extremes take place every 3 to 6 months. The Sentiment Indicator is currently at 79.26 indicating the sentiment in the stock market is neutral. Risk of a long term trend reversal low. This means the current long term trend is likely to continue. Extreme measures of this trend range are 70 to 80. This indicator's trend cycle extremes take place every 18 to 24 months. The Dow Jones Industrial Average closed at 17,730.48, down -179.85 or -1%. S&P 500 closed at 2,078.58 down -20.61 or -0.98%. Nasdaq Composite closed at 5,095.30 down -51.82 or -1.01%. 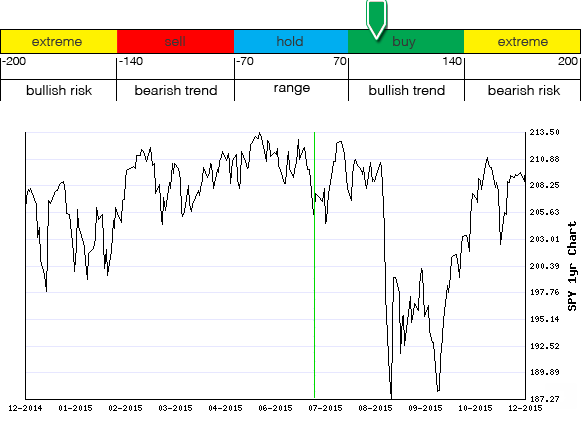 Market conditions are Mildly bullish in a Bear Market as of 2015-11-09. This means traders and investors should consider trading with a Neutral or Bullish bias by buying stocks and setting tight stops. The rank of the Bear Market is -0.44. The Most recent Sell Signal came on Sept 21, 2015. 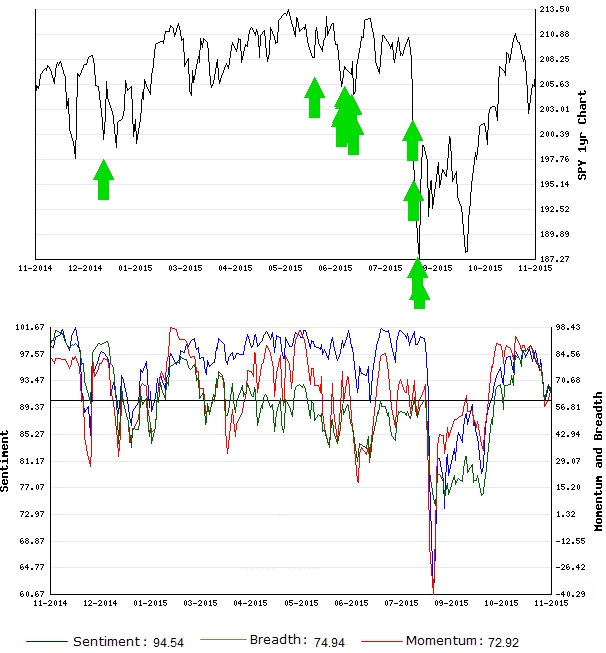 The short term market timing portion of the newsletter shows a combination of all three indicators on one graph, the momentum, breadth and sentiment indicators. The red and green arrows on the chart above the indicator chart will show each time these indicators gave confirmation or confluence that meet the buy or sell criteria. When market conditions are at extreme levels this group of indicators will find reversal ranges. If you see multiple arrows stacked one on the other each represents the day that the confirmation signal was still in place. 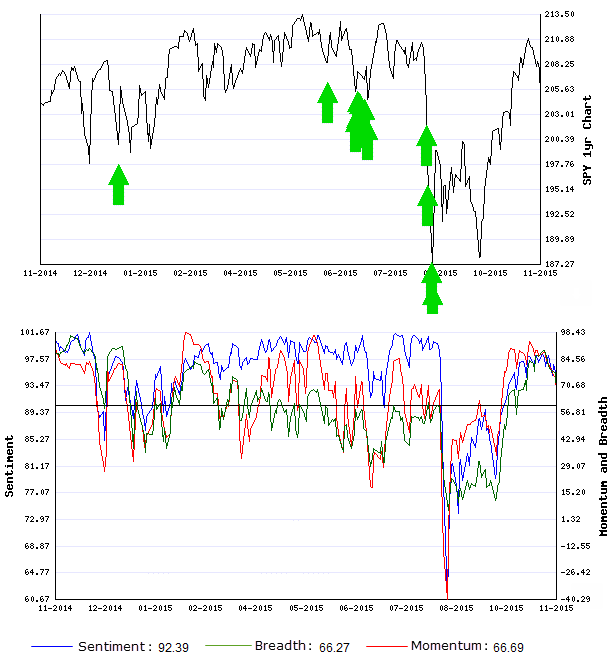 Sell Signals are generated when sentiment is above breadth and Breadth is above momentum and all are above 90. Buy signals are generated when momentum is lower than breadth, breadth is lower than sentiment and both breadth and momentum are lower than 40. 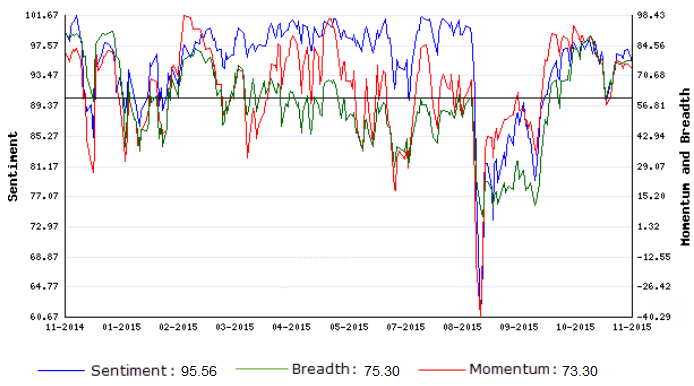 Values shown for Momentum, Breadth and Sentiment on the above charts do not match those of the ones below, data has been normalized here. Evaluate those charts individually. 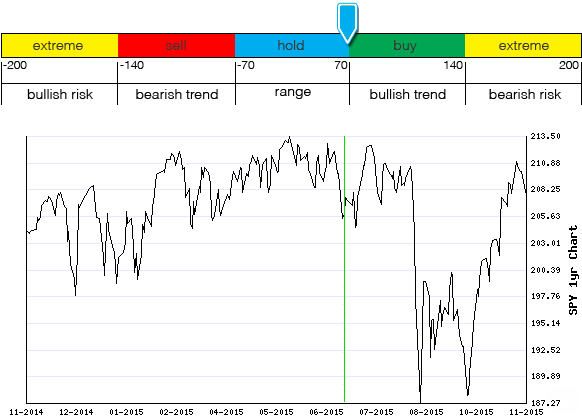 The Momentum Indicator is currently at 73.47 indicating a bullish trend in stocks. Risk of a trend reversal is low. This means the current short term bullish trend is likely to continue. Extreme measures of this trend range are 70 to 140. This indicator's trend cycle extremes take place every 3 to 6 months. The vertical buy and sell lines will only show a new line if a subsequent buy or sell signal has already been generated. For example, the indicator may be showing that it is in the buy range but there will not be a new buy Signal vertical line on the chart if there has not yet been a sell signal. 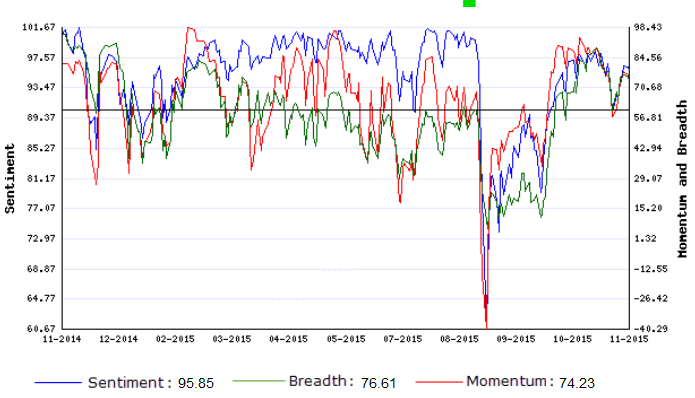 The Breadth Indicator is currently at 70.63 indicating the breadth of stocks moving higher igher is bullish. Risk of a bearish trend reversal low. This means the current bullish trend is likely to continue. Extreme measures of this trend range are 65 to 80. This indicator's trend cycle extremes take place every 3 to 6 months. The Sentiment Indicator is currently at 95.01 indicating the sentiment in the stock market is showing extreme complacency. 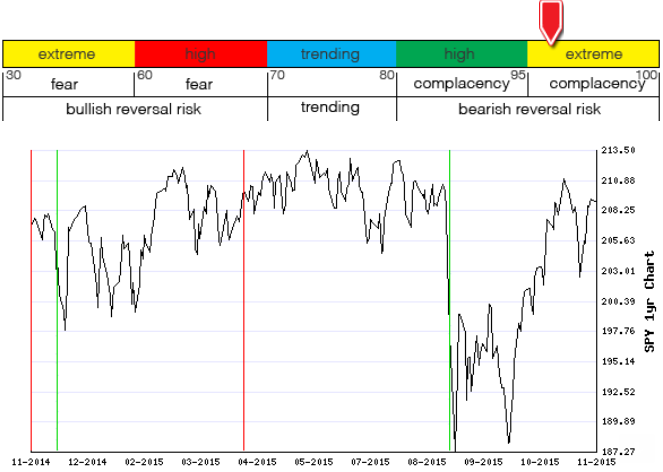 Risk of a long term bearish trend reversal is extreme. This means the current long term bullish trend is NOT likely to continue. Extreme measures of this trend range are 95 to 100. This indicator's trend cycle extremes take place every 18 to 24 months. The Dow Jones Industrial Average closed at 17,758.21, up 27.73 or 0.16%. S&P 500 closed at 2,081.71 up 3.13 or 0.15%. Nasdaq Composite closed at 5,083.24 down -12.06 or -0.24%. 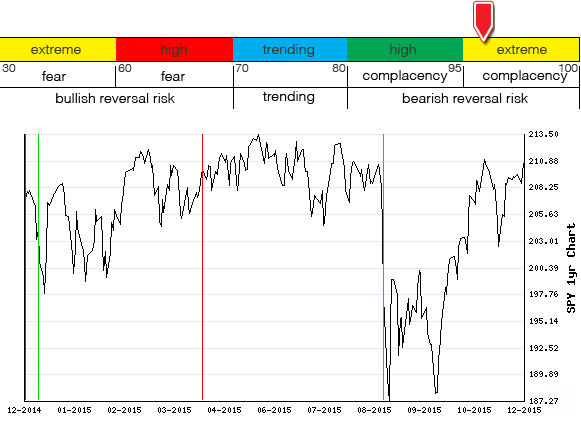 Market conditions are Mildly bearish in a Bear Market as of 2015-11-10. This means traders and investors should consider trading with a bearish bias by raising stop levels on winners and selling losers. The rank of the Bear Market is -0.39. The Most recent Sell Signal came on Sept 21, 2015. The red and green arrows on the chart above the indicator chart will show each time these indicators gave confirmation or confluence that meet the buy or sell criteria. When market conditions are at extreme levels this group of indicators will find reversal ranges. If you see multiple arrows stacked one on the other each represents the day that the confirmation signal was still in place. 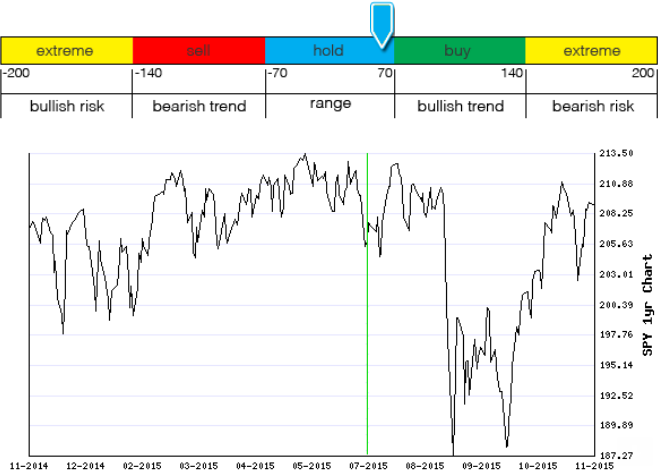 The Momentum Indicator is currently at 67.83 indicating short term Non-trending environment in stocks. This means the stock market is stalling in the current short term trend. Extreme measures of this trend range are -70 to 70. This indicator's trend cycle extremes take place every 3 to 6 months. 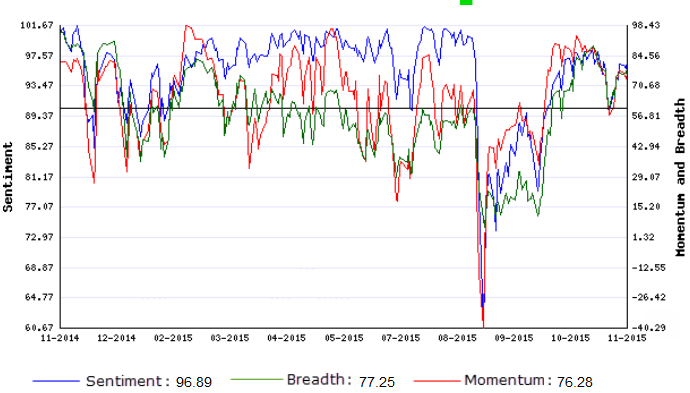 The Breadth Indicator is currently at 71.23 indicating the breadth of stocks moving higher igher is bullish. Risk of a bearish trend reversal low. This means the current bullish trend is likely to continue. Extreme measures of this trend range are 65 to 80. This indicator's trend cycle extremes take place every 3 to 6 months. The Sentiment Indicator is currently at 96.75 indicating the sentiment in the stock market is showing extreme complacency. 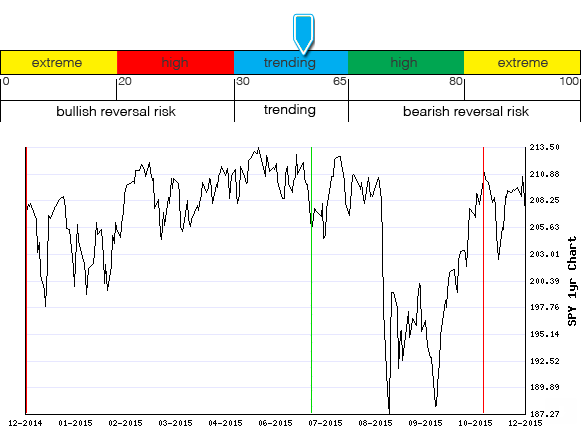 Risk of a long term bearish trend reversal is extreme. This means the current long term bullish trend is NOT likely to continue. Extreme measures of this trend range are 95 to 100. This indicator's trend cycle extremes take place every 18 to 24 months. The Dow Jones Industrial Average closed at 17,448.07, down -254.15 or -1.44%. S&P 500 closed at 2,045.97 down -29.03 or -1.4%. Nasdaq Composite closed at 5,005.08 down -61.94 or -1.22%. 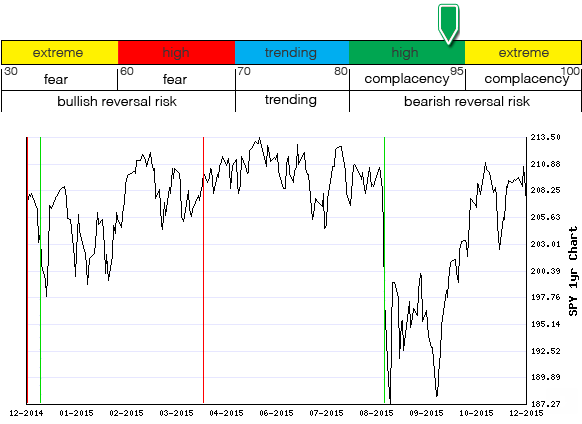 Market conditions are Mildly bearish in a Bear Market as of 2015-11-12. This means traders and investors should consider trading with a bearish bias by raising stop levels on winners and selling losers. The rank of the Bear Market is -0.37. The Most recent Sell Signal came on Sept 21, 2015. The red and green arrows on the chart above the indicator chart will show each time these indicators gave confirmation or confluence that meet the buy or sell criteria. When market conditions are at extreme levels this group of indicators will find reversal ranges. If you see multiple arrows stacked one on the other each represents the day that the confirmation signal was still in place. 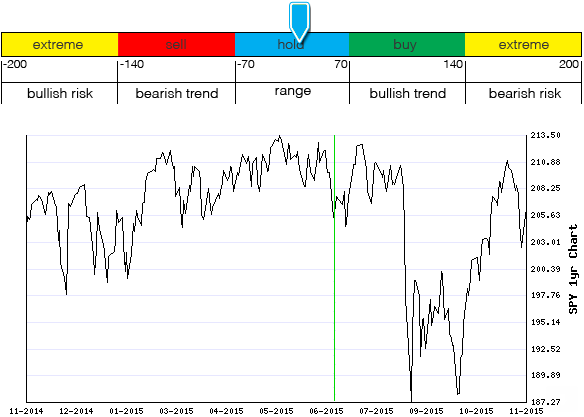 The Momentum Indicator is currently at 18.20 indicating short term Non-trending environment in stocks. This means the stock market is stalling in the current short term trend. Extreme measures of this trend range are -70 to 70. This indicator's trend cycle extremes take place every 3 to 6 months. The Breadth Indicator is currently at 60.11 indicating the breadth of stocks moving higher is neutral. Risk of a trend reversal low. This means the current trend is likely to continue. Extreme measures of this trend range are 30 to 65. This indicator's trend cycle extremes take place every 3 to 6 months. The Sentiment Indicator is currently at 92.39 indicating the sentiment in the stock market is showing high complacency. Risk of a long term trend reversal is low. This means the current long term trend is likely to continue. Extreme measures of this trend range are to 80 to 90. This indicator's trend cycle extremes take place every 18 to 24 months. The Dow Jones Industrial Average closed at 17,489.50, up 6.49 or 0.04%. S&P 500 closed at 2,050.44 down -2.75 or -0.13%. Nasdaq Composite closed at 4,986.01 up 1.39 or 0.03%. 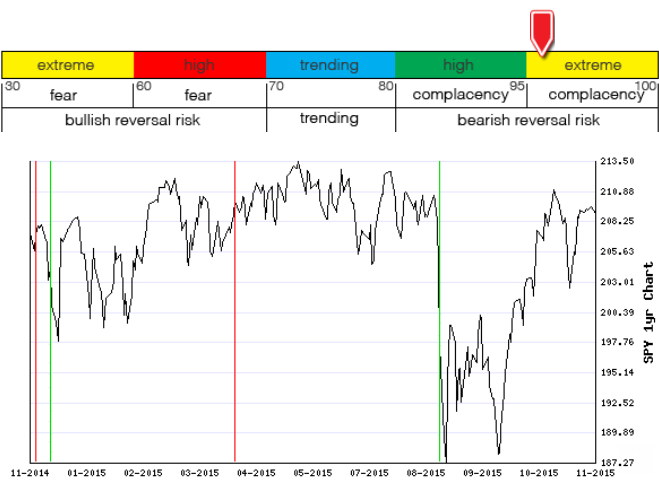 Market conditions are Mildly bearish in a Bear Market as of 2015-11-17. This means traders and investors should consider trading with a bearish bias by raising stop levels on winners and selling losers. The rank of the Bear Market is -0.47. The Most recent Sell Signal came on Sept 21, 2015. 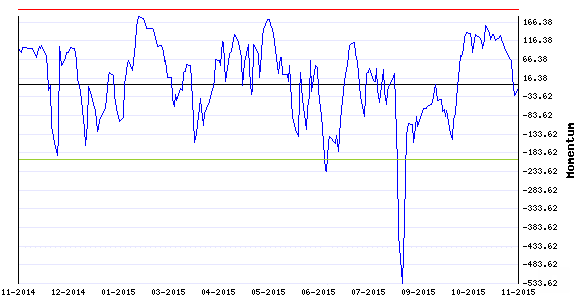 The Momentum Indicator is currently at 10.07 indicating short term Non-trending environment in stocks. This means the stock market is stalling in the current short term trend. Extreme measures of this trend range are -70 to 70. This indicator's trend cycle extremes take place every 3 to 6 months. The Breadth Indicator is currently at 59.32 indicating the breadth of stocks moving higher is neutral. Risk of a trend reversal low. This means the current trend is likely to continue. Extreme measures of this trend range are 30 to 65. This indicator's trend cycle extremes take place every 3 to 6 months. The Sentiment Indicator is currently at 91.72 indicating the sentiment in the stock market is showing high complacency. Risk of a long term trend reversal is low. This means the current long term trend is likely to continue. Extreme measures of this trend range are to 80 to 90. This indicator's trend cycle extremes take place every 18 to 24 months. The Dow Jones Industrial Average closed at 17,737.16, up 247.66 or 1.42%. S&P 500 closed at 2,083.58 up 33.14 or 1.62%. Nasdaq Composite closed at 5,075.20 up 89.19 or 1.79%. 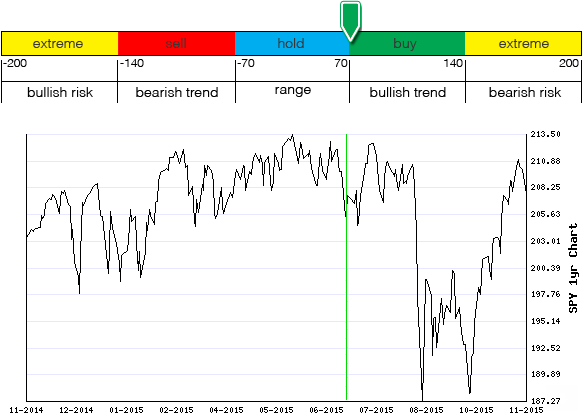 Market conditions are Mildly bullish in a Bear Market as of 2015-11-18. This means traders and investors should consider trading with a Neutral or Bullish bias by buying stocks and setting tight stops. The rank of the Bear Market is -0.42. The Most recent Sell Signal came on Sept 21, 2015. 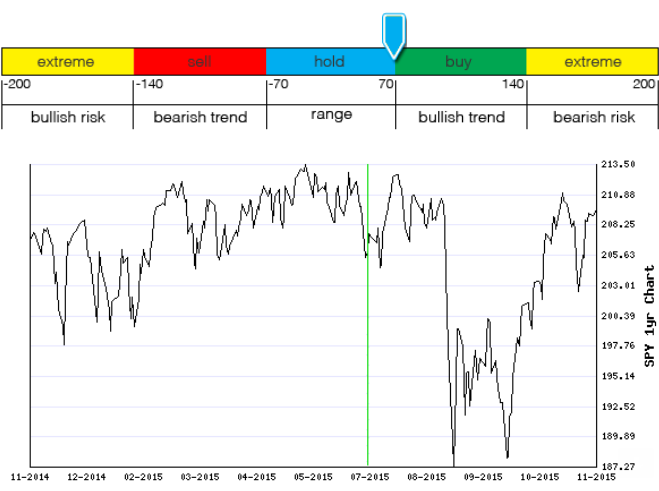 The Momentum Indicator is currently at 50.38 indicating short term Non-trending environment in stocks. This means the stock market is stalling in the current short term trend. Extreme measures of this trend range are -70 to 70. This indicator's trend cycle extremes take place every 3 to 6 months. 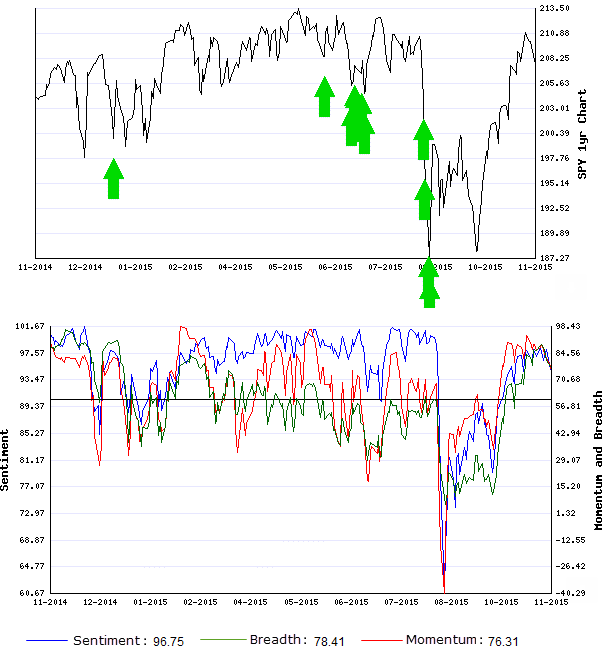 The Breadth Indicator is currently at 68.05 indicating the breadth of stocks moving higher igher is bullish. Risk of a bearish trend reversal low. This means the current bullish trend is likely to continue. Extreme measures of this trend range are 65 to 80. This indicator's trend cycle extremes take place every 3 to 6 months. The Sentiment Indicator is currently at 94.54 indicating the sentiment in the stock market is showing high complacency. Risk of a long term trend reversal is low. This means the current long term trend is likely to continue. Extreme measures of this trend range are to 80 to 90. This indicator's trend cycle extremes take place every 18 to 24 months. The Dow Jones Industrial Average closed at 17,792.68, down -31.13 or -0.17%. S&P 500 closed at 2,086.59 down -2.58 or -0.12%. Nasdaq Composite closed at 5,102.48 down -2.44 or -0.05%. 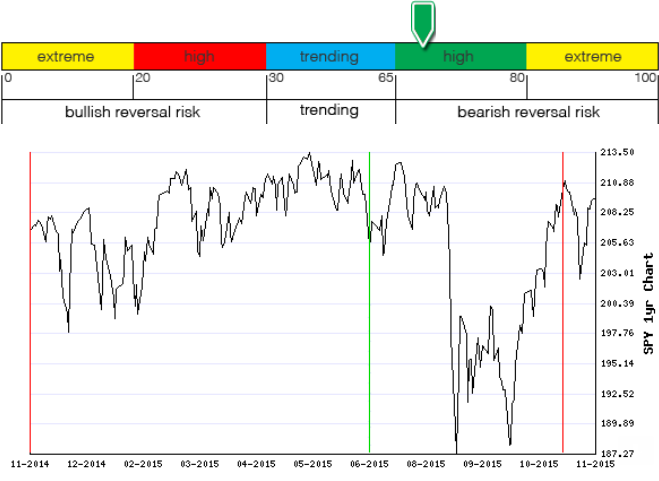 Market conditions are Mildly bullish in a Bear Market as of 2015-11-23. This means traders and investors should consider trading with a Neutral or Bullish bias by buying stocks and setting tight stops. The rank of the Bear Market is -0.40. The Most recent Sell Signal came on Sept 21, 2015. 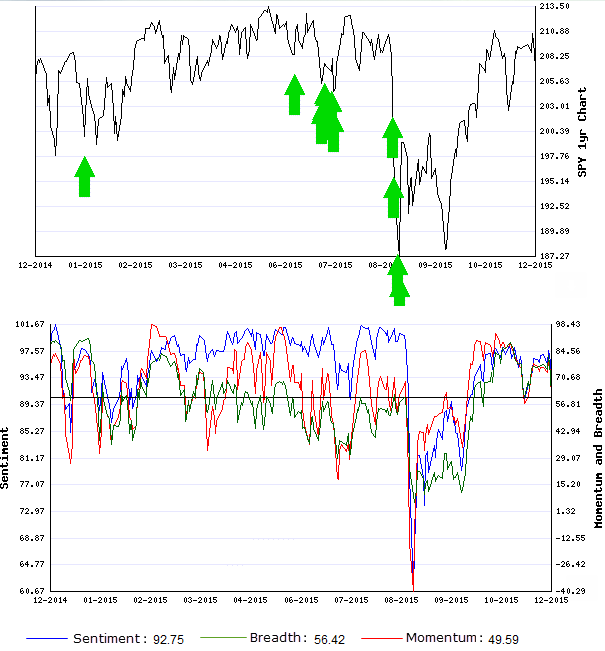 The short term market timing portion of the newsletter shows a combination of all three indicators on one graph, the momentum, breadth and sentiment indicators. The red and green arrows on the chart above the indicator chart will show each time these indicators gave confirmation or confluence that meet the buy or sell criteria. 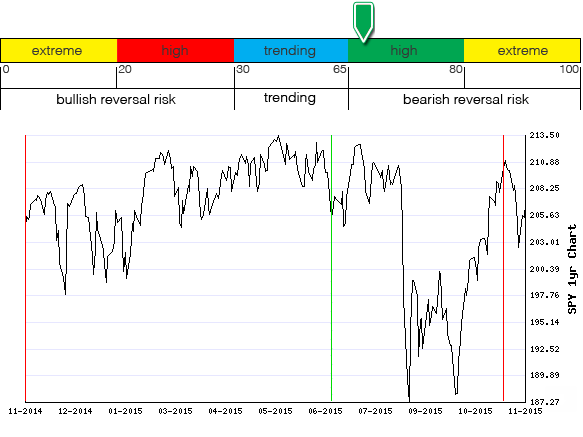 The Momentum Indicator is currently at 68.39 indicating short term Non-trending environment in stocks. This means the stock market is stalling in the current short term trend. Extreme measures of this trend range are -70 to 70. This indicator's trend cycle extremes take place every 3 to 6 months. 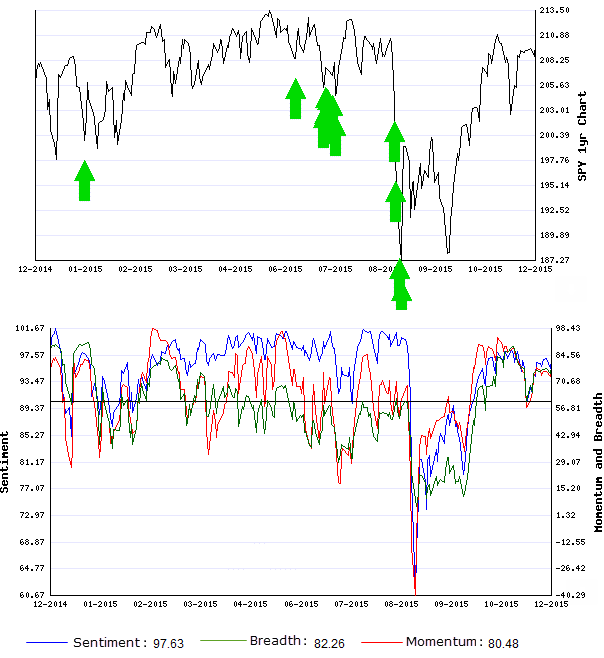 The Breadth Indicator is currently at 68.98 indicating the breadth of stocks moving higher igher is bullish. Risk of a bearish trend reversal low. This means the current bullish trend is likely to continue. Extreme measures of this trend range are 65 to 80. This indicator's trend cycle extremes take place every 3 to 6 months. The Sentiment Indicator is currently at 96.29 indicating the sentiment in the stock market is showing extreme complacency. 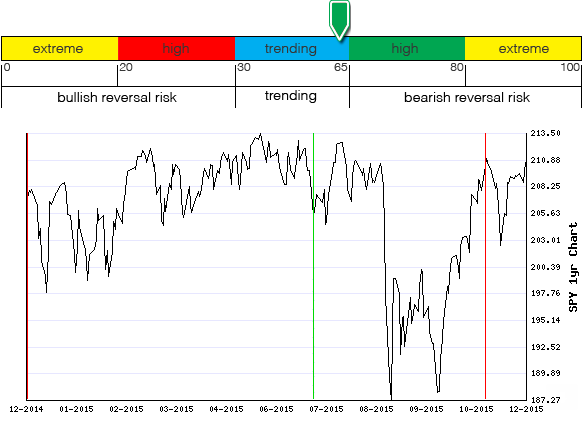 Risk of a long term bearish trend reversal is extreme. This means the current long term bullish trend is NOT likely to continue. Extreme measures of this trend range are 95 to 100. This indicator's trend cycle extremes take place every 18 to 24 months. The Dow Jones Industrial Average closed at 17,812.19, up 19.51 or 0.11%. S&P 500 closed at 2,089.14 up 2.55 or 0.12%. Nasdaq Composite closed at 5,102.81 up 0.33 or 0.01%. 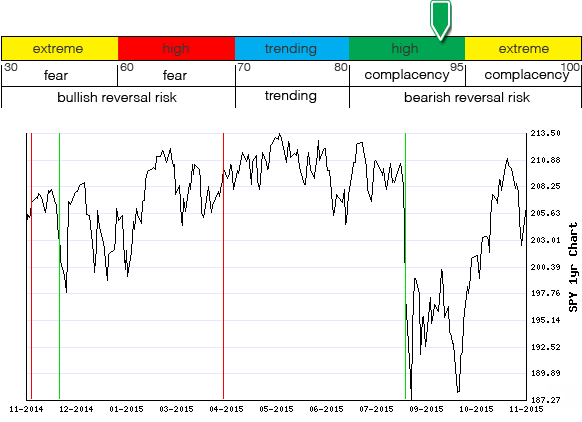 Market conditions are Mildly bullish in a Bear Market as of 2015-11-24. This means traders and investors should consider trading with a Neutral or Bullish bias by buying stocks and setting tight stops. The rank of the Bear Market is -0.35. The Most recent Sell Signal came on Sept 21, 2015. 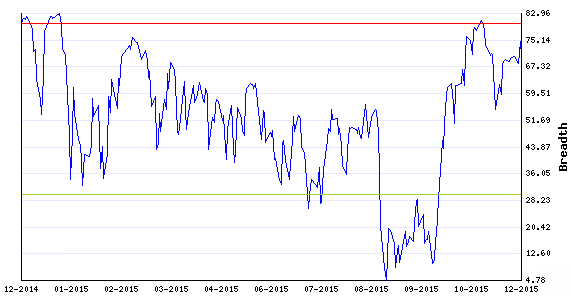 The Momentum Indicator is currently at 57.11 indicating short term Non-trending environment in stocks. This means the stock market is stalling in the current short term trend. Extreme measures of this trend range are -70 to 70. This indicator's trend cycle extremes take place every 3 to 6 months. The Breadth Indicator is currently at 69.58 indicating the breadth of stocks moving higher igher is bullish. Risk of a bearish trend reversal low. This means the current bullish trend is likely to continue. Extreme measures of this trend range are 65 to 80. This indicator's trend cycle extremes take place every 3 to 6 months. The Sentiment Indicator is currently at 95.85 indicating the sentiment in the stock market is showing extreme complacency. Risk of a long term bearish trend reversal is extreme. This means the current long term bullish trend is NOT likely to continue. Extreme measures of this trend range are 95 to 100. This indicator's trend cycle extremes take place every 18 to 24 months. The Dow Jones Industrial Average closed at 17,813.39, up 1.20 or 0.01%. S&P 500 closed at 2,088.87 down -0.27 or -0.01%. Nasdaq Composite closed at 5,116.14 up 13.33 or 0.26%. 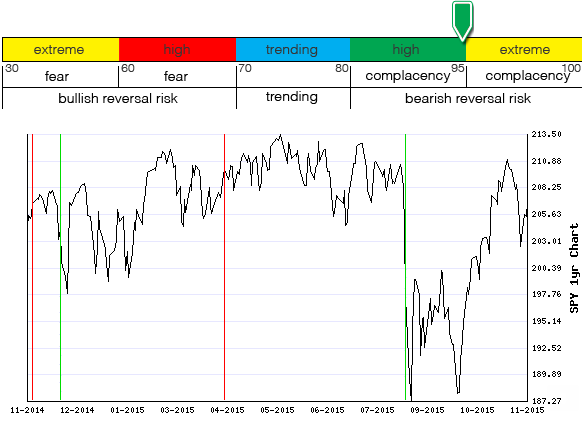 Market conditions are Mildly bullish in a Bear Market as of 2015-11-25. This means traders and investors should consider trading with a Neutral or Bullish bias by buying stocks and setting tight stops. The rank of the Bear Market is -0.30. The Most recent Sell Signal came on Sept 21, 2015. 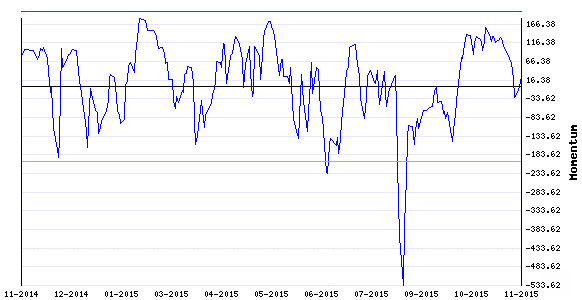 The Momentum Indicator is currently at 67.70 indicating short term Non-trending environment in stocks. This means the stock market is stalling in the current short term trend. Extreme measures of this trend range are -70 to 70. This indicator's trend cycle extremes take place every 3 to 6 months. 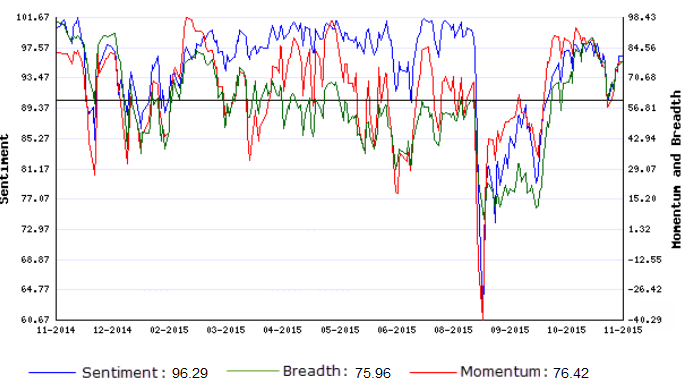 The Breadth Indicator is currently at 70.17 indicating the breadth of stocks moving higher igher is bullish. Risk of a bearish trend reversal low. This means the current bullish trend is likely to continue. Extreme measures of this trend range are 65 to 80. This indicator's trend cycle extremes take place every 3 to 6 months. The Sentiment Indicator is currently at 96.89 indicating the sentiment in the stock market is showing extreme complacency. Risk of a long term bearish trend reversal is extreme. This means the current long term bullish trend is NOT likely to continue. Extreme measures of this trend range are 95 to 100. This indicator's trend cycle extremes take place every 18 to 24 months. The Dow Jones Industrial Average closed at 17,719.92, down -78.57 or -0.44%. S&P 500 closed at 2,080.41 down -9.70 or -0.46%. Nasdaq Composite closed at 5,108.67 down -18.85 or -0.37%. 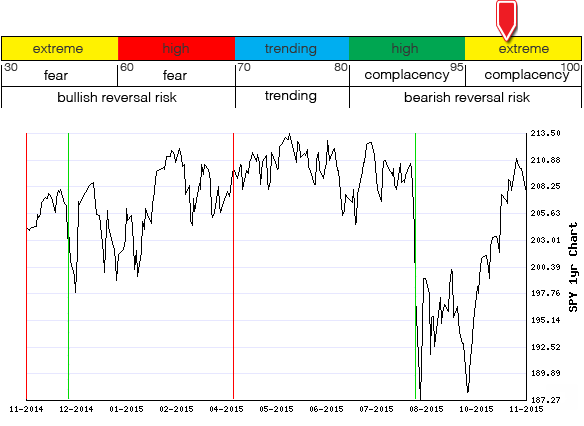 Market conditions are Mildly bullish in a Bear Market as of 2015-11-30. This means traders and investors should consider trading with a Neutral or Bullish bias by buying stocks and setting tight stops. The rank of the Bear Market is -0.28. The Most recent Sell Signal came on Sept 21, 2015. 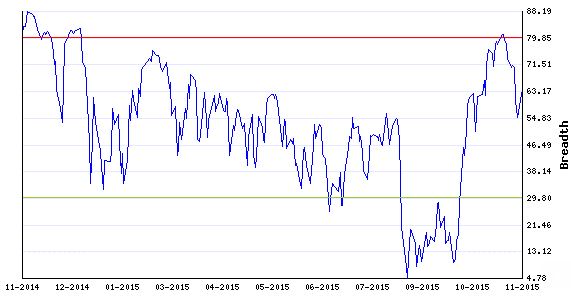 The Momentum Indicator is currently at 52.34 indicating short term Non-trending environment in stocks. This means the stock market is stalling in the current short term trend. Extreme measures of this trend range are -70 to 70. This indicator's trend cycle extremes take place every 3 to 6 months. 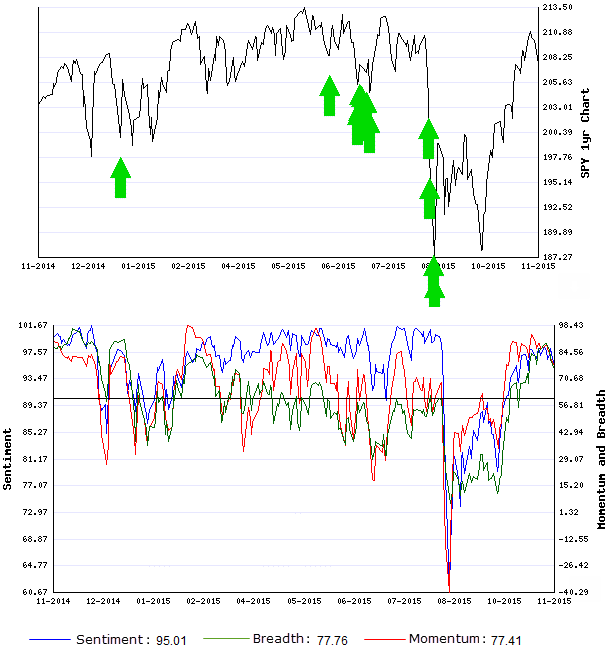 The Breadth Indicator is currently at 68.38 indicating the breadth of stocks moving higher igher is bullish. Risk of a bearish trend reversal low. This means the current bullish trend is likely to continue. Extreme measures of this trend range are 65 to 80. This indicator's trend cycle extremes take place every 3 to 6 months. The Sentiment Indicator is currently at 95.56 indicating the sentiment in the stock market is showing extreme complacency. 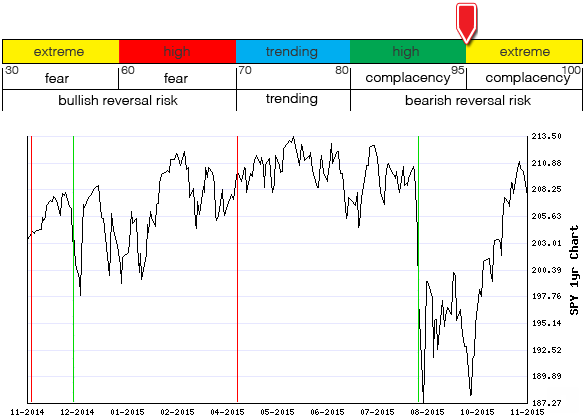 Risk of a long term bearish trend reversal is extreme. This means the current long term bullish trend is NOT likely to continue. Extreme measures of this trend range are 95 to 100. This indicator's trend cycle extremes take place every 18 to 24 months. The Dow Jones Industrial Average closed at 17,888.35, up 168.43 or 0.95%. S&P 500 closed at 2,102.63 up 22.22 or 1.07%. Nasdaq Composite closed at 5,156.31 up 47.64 or 0.93%. 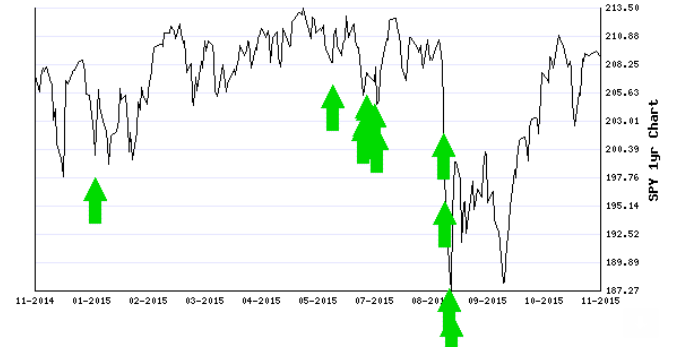 Market conditions are Bullish in a Bear Market as of 2015-12-01. This means traders and investors should consider trading with a Neutral or Bullish bias by buying stocks and setting tight stops. The rank of the Bear Market is -0.22. The Most recent Sell Signal came on Sept 21, 2015. 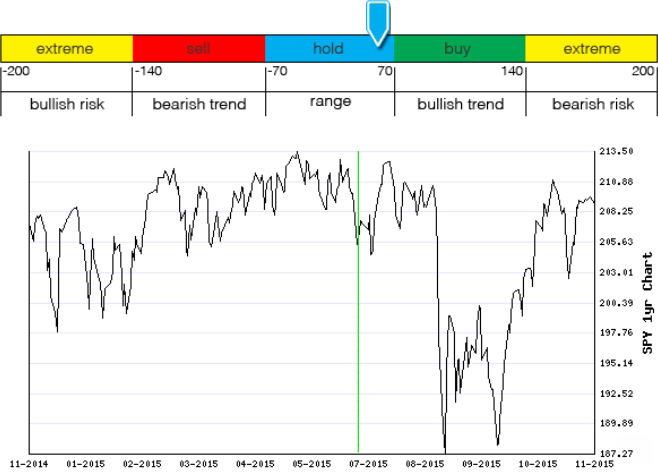 The Momentum Indicator is currently at 89.36 indicating a bullish trend in stocks. Risk of a trend reversal is low. This means the current short term bullish trend is likely to continue. Extreme measures of this trend range are 70 to 140. This indicator's trend cycle extremes take place every 3 to 6 months. 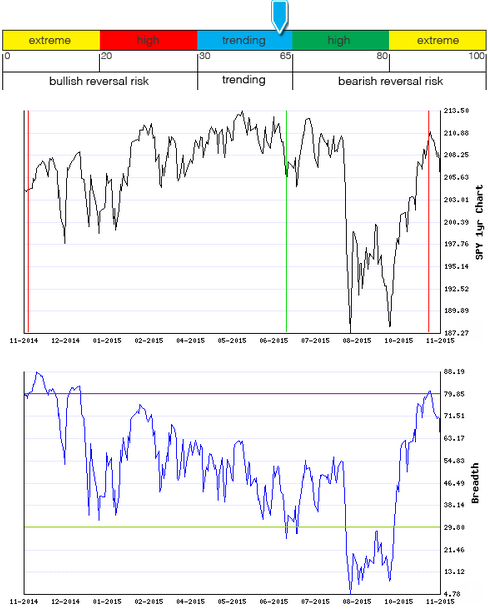 The Breadth Indicator is currently at 74.75 indicating the breadth of stocks moving higher igher is bullish. Risk of a bearish trend reversal low. This means the current bullish trend is likely to continue. Extreme measures of this trend range are 65 to 80. This indicator's trend cycle extremes take place every 3 to 6 months. The Sentiment Indicator is currently at 97.63 indicating the sentiment in the stock market is showing extreme complacency. Risk of a long term bearish trend reversal is extreme. This means the current long term bullish trend is NOT likely to continue. Extreme measures of this trend range are 95 to 100. This indicator's trend cycle extremes take place every 18 to 24 months. The Dow Jones Industrial Average closed at 17,729.68, down -158.67 or -0.89%. S&P 500 closed at 2,079.51 down -23.12 or -1.1%. Nasdaq Composite closed at 5,123.22 down -33.09 or -0.64%. 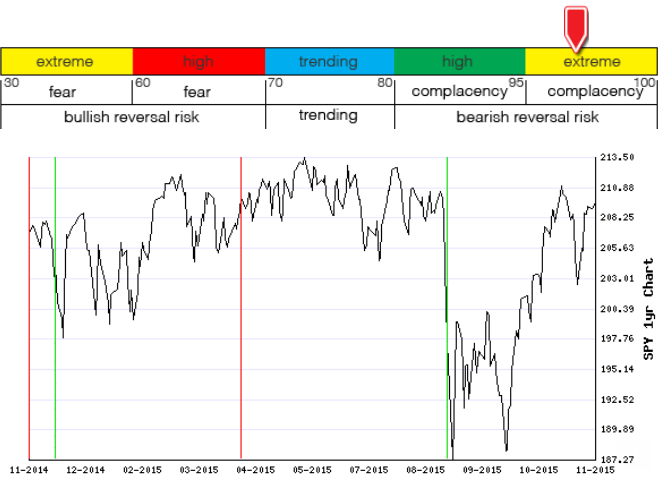 Market conditions are Mildly bearish in a Bear Market as of 2015-12-02. This means traders and investors should consider trading with a bearish bias by raising stop levels on winners and selling losers. The rank of the Bear Market is -0.18. The Most recent Sell Signal came on Sept 21, 2015. 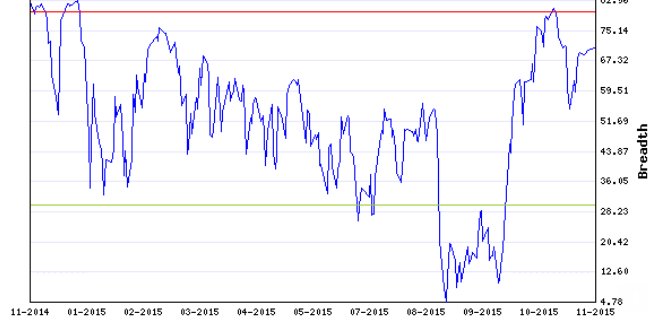 The Momentum Indicator is currently at 52.86 indicating short term Non-trending environment in stocks. This means the stock market is stalling in the current short term trend. Extreme measures of this trend range are -70 to 70. This indicator's trend cycle extremes take place every 3 to 6 months. 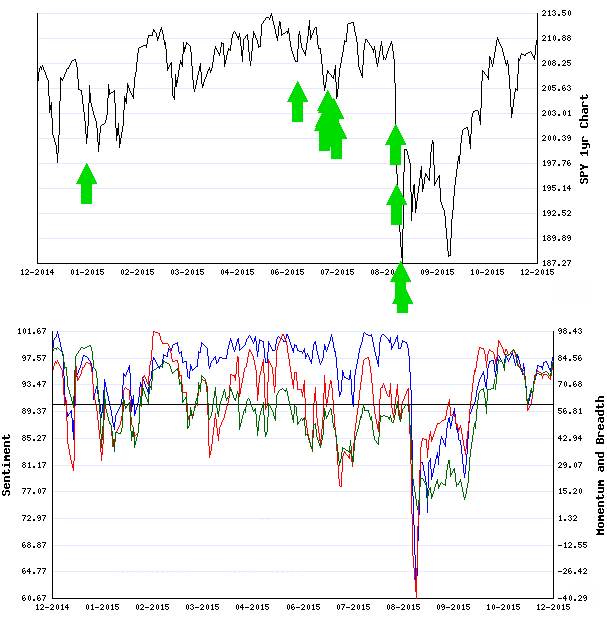 The Breadth Indicator is currently at 65.20 indicating the breadth of stocks moving higher igher is bullish. Risk of a bearish trend reversal low. This means the current bullish trend is likely to continue. Extreme measures of this trend range are 65 to 80. This indicator's trend cycle extremes take place every 3 to 6 months. The Sentiment Indicator is currently at 95.87 indicating the sentiment in the stock market is showing extreme complacency. 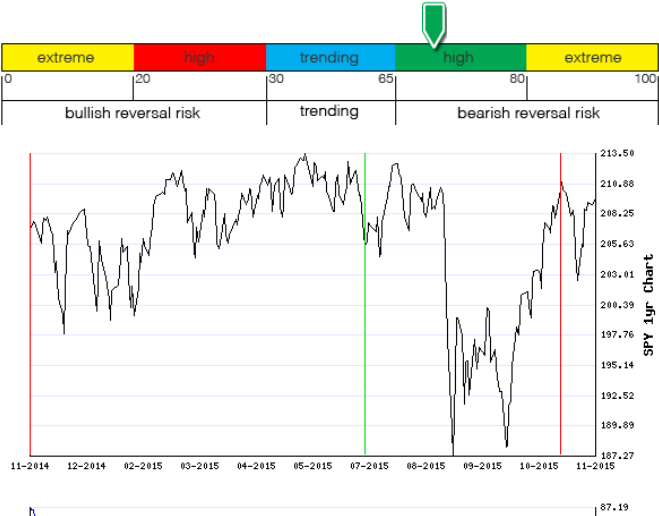 Risk of a long term bearish trend reversal is extreme. This means the current long term bullish trend is NOT likely to continue. Extreme measures of this trend range are 95 to 100. This indicator's trend cycle extremes take place every 18 to 24 months. The Dow Jones Industrial Average closed at 17,477.67, down -252.01 or -1.42%. S&P 500 closed at 2,049.62 down -29.89 or -1.44%. Nasdaq Composite closed at 5,037.53 down -85.69 or -1.67%. 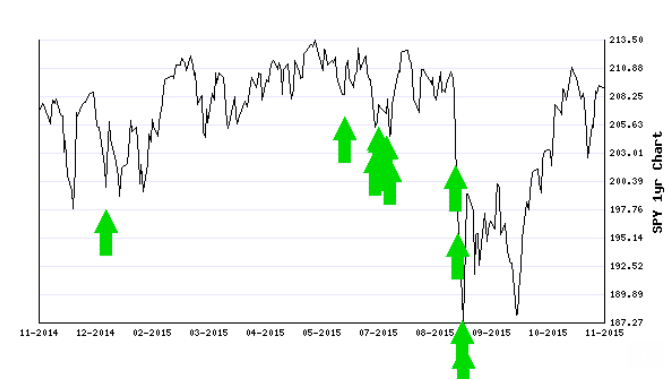 Market conditions are Bearish in a Bear Market as of 2015-12-03. This means traders and investors should consider trading with a Bearish bias by shorting stocks, buying inverse-ETF's or buying put options. The rank of the Bear Market is -0.19. The Most recent Sell Signal came on Sept 21, 2015. 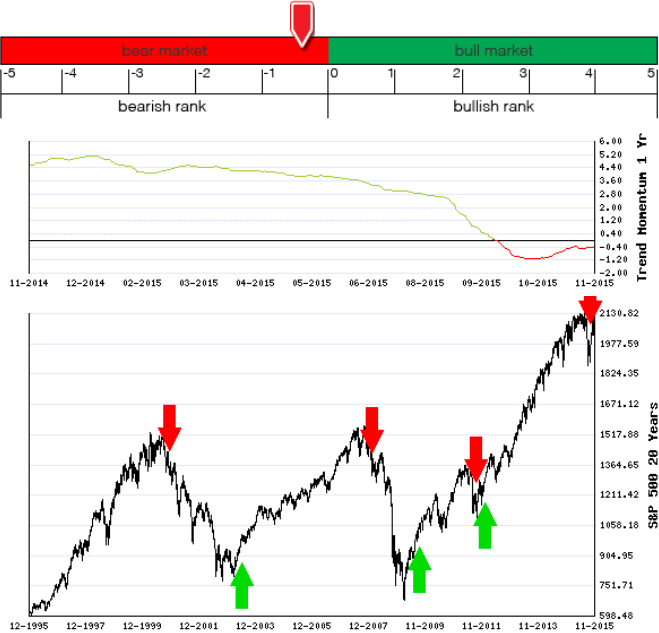 The Momentum Indicator is currently at -70.02 indicating a bearish trend in stocks. Risk of a short term trend reversal is low. This means the current bearish short term trend is likely to continue. Extreme measures of this trend range are -70 to -140. This indicator's trend cycle extremes take place every 3 to 6 months. The Breadth Indicator is currently at 51.38 indicating the breadth of stocks moving higher is neutral. Risk of a trend reversal low. This means the current trend is likely to continue. Extreme measures of this trend range are 30 to 65. This indicator's trend cycle extremes take place every 3 to 6 months. The Sentiment Indicator is currently at 92.75 indicating the sentiment in the stock market is showing high complacency. Risk of a long term trend reversal is low. This means the current long term trend is likely to continue. Extreme measures of this trend range are to 80 to 90. This indicator's trend cycle extremes take place every 18 to 24 months.